This article was requested by the 1st PSYOP Battalion on the event of their 50th anniversary on 7 November 2017. Parts of the article were used in the brochure prepared for the celebration. In 2018, parts of the article were used by the 8th PSYOP Group to develop a design for an exhibit inside the battalion classroom dedicated in honor of Corporal Nicolas Roush who was killed in action on 16 August 2009 during Operation Enduring Freedom, Afghanistan. The Battalion was kind enough to award the author a challenge coin and a Certificate of Achievement depicted at the end of this article. The color white stands for purity and truth; the colors gray and black are for the second and third types. The roll of parchment prefers to the units ability to produce and disseminate written propaganda. The lightning flash is for its ability in the radio broadcast field. The Greek symbol for "PSI" refers to the psychological mission of the organization. In addition, the symbol alludes to the Battalions numerical designation by its similarity to the Roman figure "I". Below, the dark green and silver gray are colors traditionally associated with Psychological Operations organizations. The scroll refers to the units ability to produce and disseminate written propaganda. 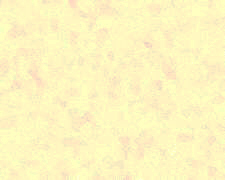 The color white is indicative of purity and truth, the first and preferred type of propaganda; the colors gray and black represent the second and third types of propaganda used by the unit when necessary. The lightning flash reflects the battalions information distribution functions via electronic media. The Greek letter PSI suggests the word psychological and is indicative of the units mission. The primary structure of the letter resembles the numeral 1 and denotes the battalions designation. 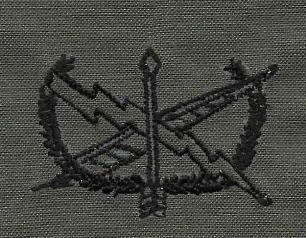 Above, the upright dagger suggests the battalions numerical designation while highlighting the cutting edge of psychological military operations and technology. Gold is emblematic of honor and high achievement. The Taeguk represents Korean War service, while the green and white cord colors allude to the Caribbean and Grenada. The chess knight embodies power of movement and direction, symbolizing the importance of intelligence in formulating military strategy and countermeasure. The 1st Psychological Operations Battalion is a subordinate unit of the 4th Psychological Operations Group. It has regional responsibility for Latin America, the southern hemisphere covered by Southern Command as well the region covered by Atlantic Command. The Battalion produces and disseminates written propaganda. It also has the ability to operate in the radio broadcast field. In early October of 2017, an officer of the 1st POB wrote to ask if I could help him in a research project. He had already accumulated an enormous amount of material so I countered his request and said, why not write a story about the unit instead? I had written about four other psychological operations units in the past so this would be an interesting project. He agreed, and combining his facts and my files, this is the story. The forerunner of the current unit was organized in the Regular Army at Fort Riley, Kansas, on 8 November 1950 as Headquarters and Headquarters Company, (HHC) 1st Radio Broadcasting and Leaflet Group. The first commander was LTC Homer E. Shields. The Group arrived in Tokyo, Japan, on 6 August 1951. They were headquartered on the 6th floor of Empire House. The enlisted personnel were quartered in the Japanese government Finance Building on B Avenue in the heart of Tokyo. The Officers were billeted in Officer's Clubs around Tokyo. 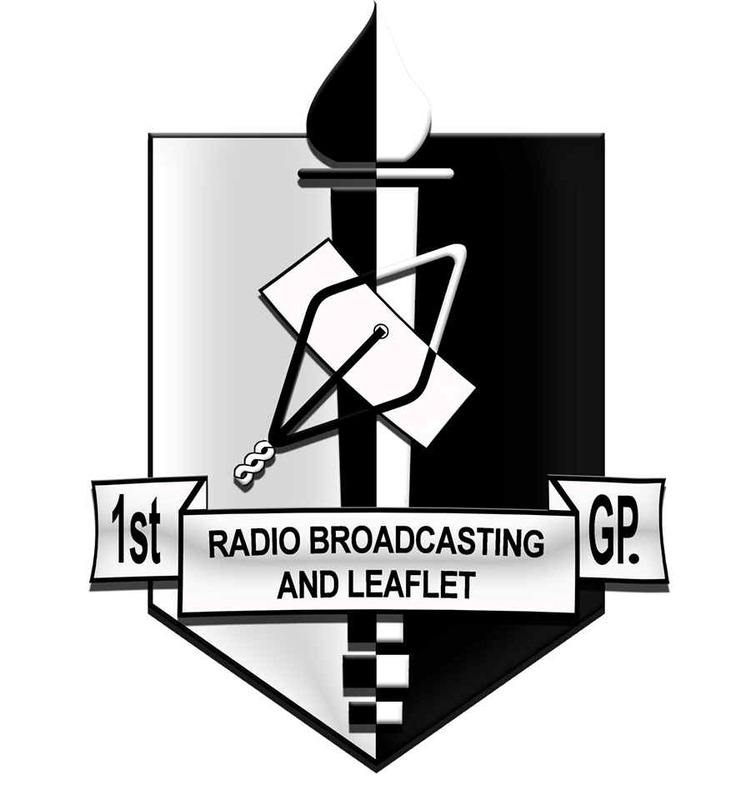 On 1 September 1951 it was reorganized and redesignated as Headquarters and Headquarters Company, 1st Radio Broadcasting and Leaflet Group, 8239th Army Unit. We did a 5.5 x 8.5-inch job which included a four-color printing from a painting done at HQ in Tokyo. The Harris LTV is a single-color press, so if you want two or more colors, you have to run the sheets as many times as you have colors. My point is that our unit was not equipped to do four-color halftones both because of the difficult photolithography and the printing. However, we had a very smart Section Chief named Master Sergeant William E Stewart and he was anxious to try running it through four times in perfect alignment. We did it and the leaflet turned out perfect and was disseminated. Another problem we had with printing multicolored leaflets was due to the rapid humidity changes which varied the size of the sheets between colors. It was very difficult to keep the image in register. Sometimes it would be a week or so before the pressmen could get to the next color. We managed to turn those leaflets out because of our dedicated men and leaders. During the Korean War the Group consisted of the HHC, the 4th MRBC, and the 3rd Reproduction Company. The 1st RB&L was the strategic Psywar asset for Far East Command starting in August 1951. The Army, to find enlisted men for jobs that required a university degree, set up a special classification and assignment unit at Ft. Myer, in Arlington, Va. Towards the end of 1950, orders went out to send all draftees with college degrees to Fort Myer after they finished basic training to be interviewed for possible special assignments. It was through this process that draftees with experience in journalism, radio, advertising and graphic arts found themselves in the 1st RB&L Group. The unit was formed in Ft. Riley, Kan. It was created by Fifth Army General Order #176, April 1951. The first commander was Lieutenant Colonel Homer E. Shields, former Chief of Psywar section of the Sixth Army Group, and later Executive Officer to General McClure, head of the Psychological Warfare Division, Supreme Headquarters, Allied Expeditionary Force (SHAEF). The Radio Company had three platoons, each with a complete mobile transmitter that could be attached to more powerful theater elements. In 1953, a Consolidation Company was added to the group when it became clear that there was a need to prepare propaganda specifically aimed at civilians in the rear or in occupied areas under Allied control. COMMUNISTS KEEP THE TRUTH FROM YOU! Dear son, conditions here at home are terrible. The communists have made slaves of us. 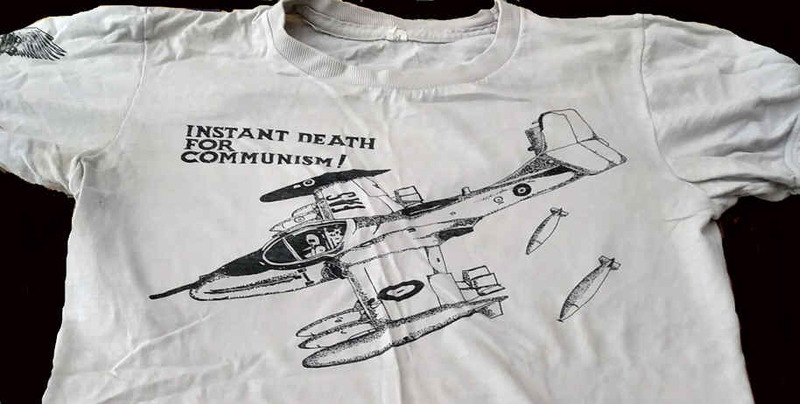 The communists even take our food and clothing. 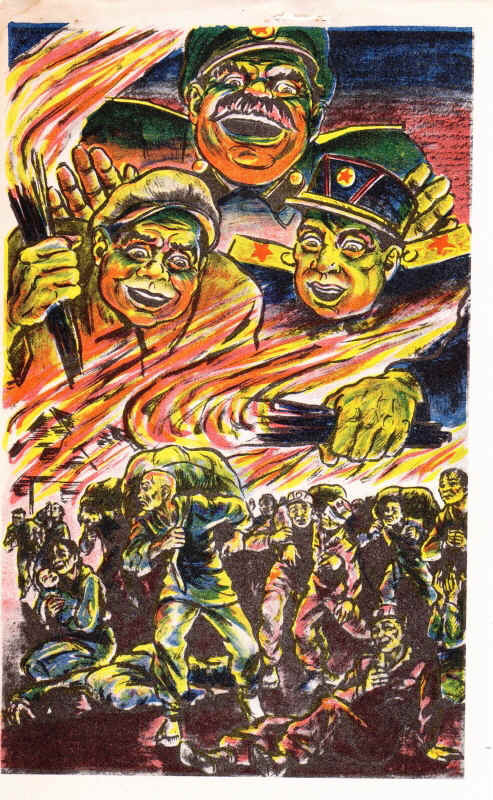 Mao Tse-tung is now a tyrannical devil. I am worn out and your mother is sick. We want to see you. Come home as soon as you can. One of the most famous PSYOP campaigns of the Korean War was Operation Moolah, the plot to buy a MiG-15 from a defecting Communist pilot. On 1 April, the U.N. Joint Psychological Warfare committee approved Operation Moolah. The data sheets of the Headquarters, 1st Radio Broadcasting & Leaflet Group, 8239 AU, APO 500, are all dated 20 April 1953. The United Nations Command offered $50,000 to any pilot who flew his MiG-15 to the south. It offered an additional $50,000 to the first pilot who took advantage of this offer. 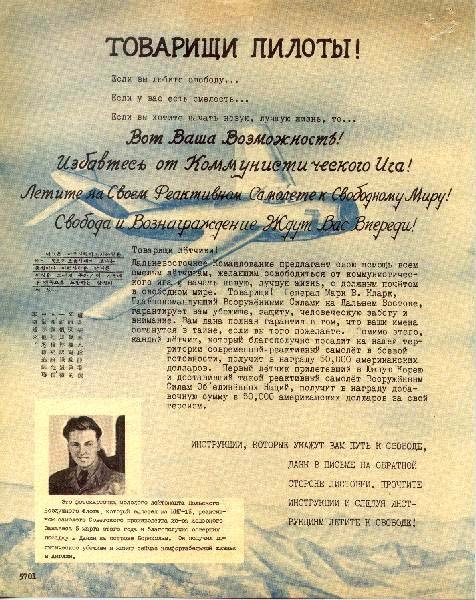 The campaign used both radio and aerial leaflets in the Russian, Chinese, and Korean languages. It was believed at the time, and later proven, that all three countries provided pilots for the air war over North Korea. Each of the three countries (The U.S.S.R., China, and North Korea) operated their own air force units as if they were fighting against their enemies. No pilot served in another country's air force unit. All the MiG-15s, however, were marked with North Korean insignia (A red star inside red and blue circles). If a North Korean pilot had read one of the leaflets, the money offer would have meant little. No one could have trusted the authenticity of the offer, and North Koreans knew nothing about the purchasing power of the dollar. 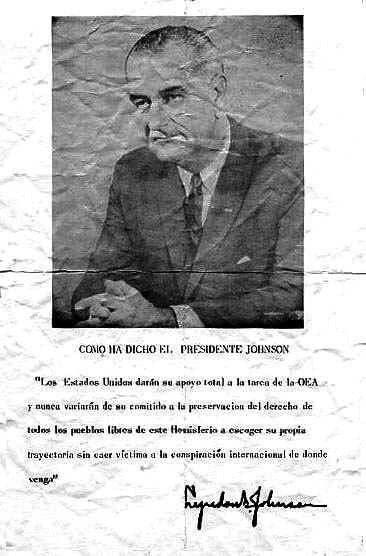 Operation Moolah may have overlooked the most important point: the defecting pilot had to be an anti-Communist who wanted political asylum in the United States, Therefore, a statement in the leaflet of guaranteeing freedom and a job in America after defection would have been more effective. 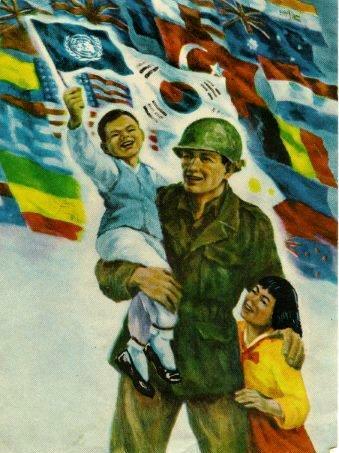 After the end of the Korean War, the 1st went back to doing the usual training activities: war games, language and printing classes, and all the other everyday duties of a PSYOP unit. For training, parts of a PSYOP unit are sometimes added to one or both sides in war games to produce leaflets and practice their ability to print material and disseminate it in the field. This leaflet is designed to keep the enemy force awake at night worrying about being bitten by a poisonous spider. Other similar leaflets mention poisonous snakes crawling into sleeping bags for warmth while the soldier sleeps. Black widow spiders are known to be in this area. Smaller than an inch in size, it is impossible to see them at night. The poison which black widows inject into their victims is deadly  fifteen times more potent than rattlesnake poison. The Widow seeks a warm place to rest at night  like beside a sleeping man. If you remain awake you might feel it. 1st Radio Broadcasting and Leaflet Battalion, Ft. Bragg, N.C.
On 24 June 1960, the unit was reorganized and redesignated as Headquarters and Headquarters Company, 1st Psychological Warfare Battalion. As such, the unit took part in Operation Power Pack in the Dominican Republic. When the Cuban Missile Crisis occurred, the S-4 called me and told me to take covered trucks to Pope AFB, and bring them directly to the Battalion's print shop (I was one of few with a Top Secret clearance). We had triple concertina wire around the print shop while we printed leaflets and packed them into leaflet bombs. I don't know if the leaflet bombs were dropped, nor if there was any other form of dissemination. The leaflets were highly classified although the photo later appeared in media (I think Air Force magazine was one). The leaflet they depicted was one of the Russian missile sites on Cuban soil. Note: Operation, Bugle Call would ultimately drop six million leaflets by F-105 fighters showing the Russian missiles on Cuban soil to convince any Cubans that believed it was an American propaganda plot. 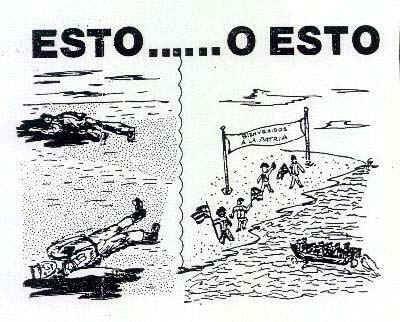 One leaflet is entitled La Verdad (the Truth) and depicts a Russian missile site on Cuban soil. 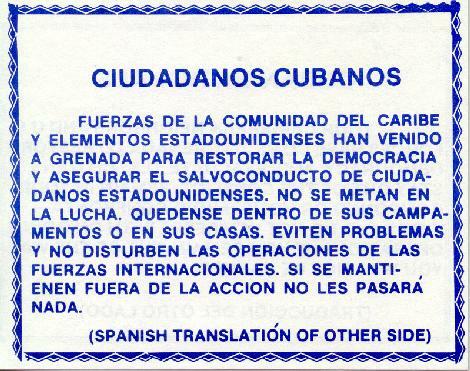 Leaflets were also prepared in case the United States took part in a full scale invasion of Cuba. One showed a woman and child among falling bombs, the other depicted Fidel Castro sneaking off the island with bags of gold. One of the strangest operations the 1st PSYOP Battalion ever got into was a 1963 war game called Operation Water Moccasin. It was a series of US Army maneuvers scheduled to take place in the South, specifically Claxton, Georgia (The Fruitcake Capital of the World.) to instruct US soldiers in counter-guerrilla warfare. It was scheduled to be witnessed by 124 foreign military officers. In 1963 I attended the Psychological Operations Officer course at the Special Warfare School. While a student, I participated in Operation Water Moccasin in Georgia. A Thai Air Force major, a lieutenant from the battalion and I were sent to Ludowici, Georgia, to provide propaganda support to the Special Forces, who were opposed by the 82d Airborne Division. Conservatives accused the federal government of enabling either a foreign invasion or some kind of military coup. The military futilely protested that the presence of foreign military observers was standard procedure and that all observers were from US allies. Conservative religious broadcasters and Conservative elected officials about the operation and fired up their constituents basic fears and paranoia. They said that United States was about to be taken over by the United Nations; or African troops were massing in Georgia to invade and occupy that state. One elected official reported that at the height of this rumor-mongering he was receiving 100-200 letters a day from constituents who were genuinely scared. The worst rumors were traced to a radio evangelist named C.W. Burpo. He said the information came directly from California Congressman James B. Utt. Representative Utt was interviewed on camera and reluctantly admitted hed fabricated most of the story, including the parts about foreign invaders. In February 1963, Juan Bosch, the head of the Dominican Revolutionary Party was elected and inaugurated as the President of the Dominican Republic. His pro-Castro sentiments and left-leaning politics led to a military coup seven months later by an archconservative faction of the military led by Colonel Elias Wessin y Wessin. On 24 April 1965, a group within the Army, led by Col. Francisco Caamano Deno rose up and attempted to restore Juan Bosch to the presidency. The pro-Bosch rebels known as Constitutionalists, took to the streets, seized the national palace and the Government radio and television stations in Santa Domingo, and demanded Bosch's return. 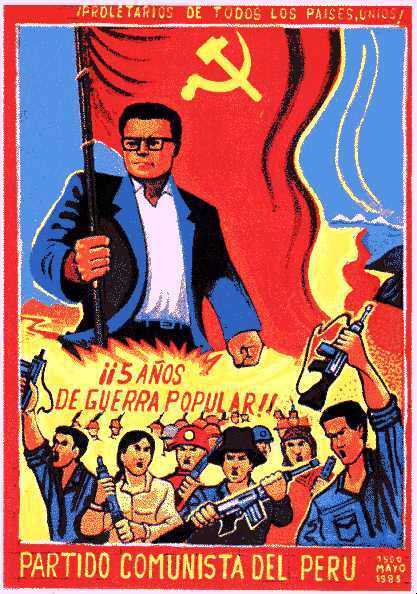 Santo Domingo's streets were filled with looting and lawlessness as the Soviet-oriented Dominican Revolutionary Party, and the Castroite 14th of June Revolutionary Party armed their members. Bands of teenagers (Los Tigres) swarmed through Santo Domingo shooting any policemen they could find. 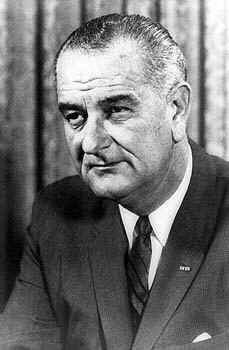 Fearing another Cuba on America's doorstep, President Lyndon Johnson ordered U.S. forces to restore order and sent a fleet of 41 vessels to blockade the island. My grandfather was labelled a Communist and lived much of his life in exile. He was caught like most of the members of his group by Trujillo's Servicio Central de Inteligencia [Central Intelligence Service] and spent several years in the prison known as La Cuarenta [The Forty] where he was tortured until Trujillo was deposed. On the afternoon of 1 May, in response to Mr. Ryan's (USIA Director) request, the 1st PSYWAR Battalion at Ft. Bragg, North Carolina, was directed to dispatch the first elements of the Army's psychological warfare effort in support of the operation directed by the USIS. Operational elements of the 1st PSYWAR Company (Field Army), reinforced with radio broadcast and light, mobile audiovisual teams, as well as language experts, were readied for a midnight departure. A liaison officer was dispatched to join Mr. Ryan with the mission of coordinating military support and assisting the over-all operation in any way possible. 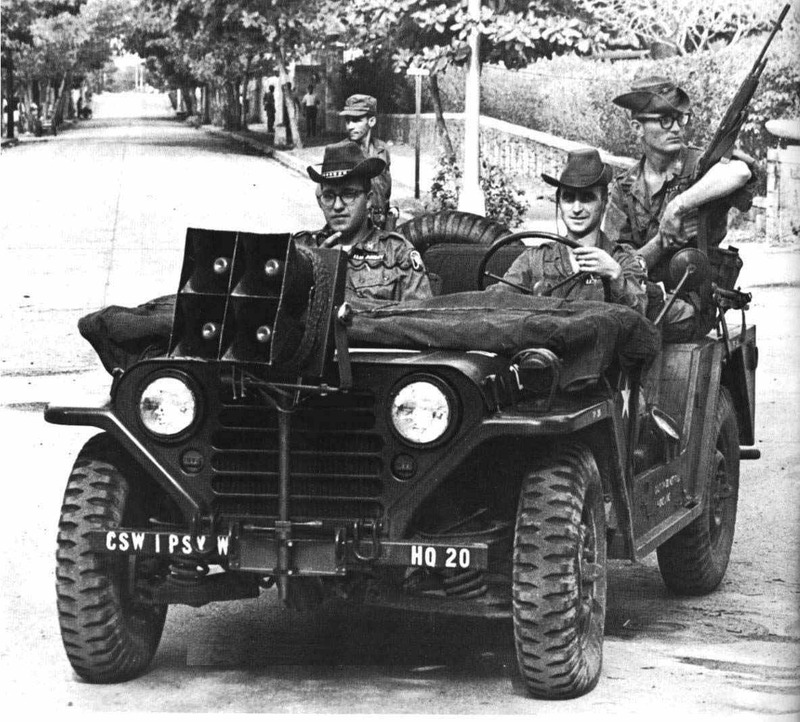 The battalion's van-mounted radio was prepared to follow shortly by heavy airlift. I was one of 8 or 9 GI's running a portable radio station called the "Voice of the Security Zone" that went on the air May 5th. We were up and running a few days before that but I was the only announcer (my MOS listed "broadcast specialist") and I did not speak Spanish. We got a civilian in from the Voice of America (that is where he said he was from) and were up and running for the next few months. We drove west from the San Isidro Air Base several miles and turned off the main road into a residential area before (I believe) we reached the Ozama River and the Duarte Bridge (a scene of heavy fighting). In this residential area we arrived at a one-acre field with a standing AM radio broadcast tower and a small cement building. The building was empty and there were no signs of any combat in the area. This building was about 10' x 10' which was the perfect size for an AM radio transmitter and its associated equipment. There were no studio facilities in the area. We set up our equipment and used the standing antenna. Overall we had a generator, studio truck, transmitter truck, communications truck, and the antenna tuning truck. As mentioned, we were in a residential area, and the rest of the city block we were located in was all single story houses and some duplexes. 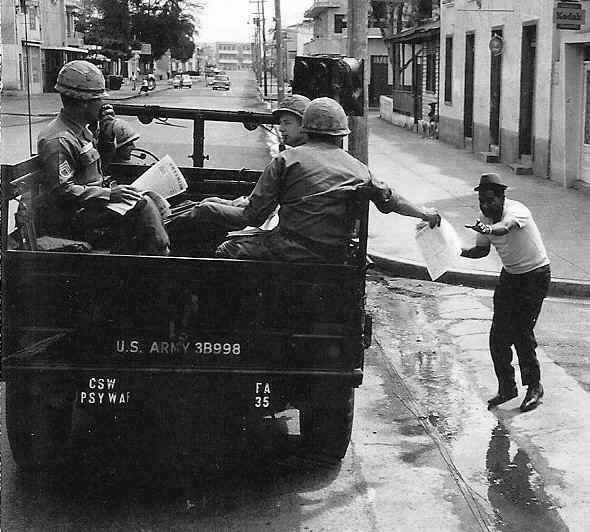 1st PSYWAR Battalion Trooper hands out newspaper to Dominican civilian. U.S. PSYWAR radio was able to monitor and answer rebel radio diatribes about "Yanqui imperialismo" and put out the first newspaper since the outbreak of the revolt. 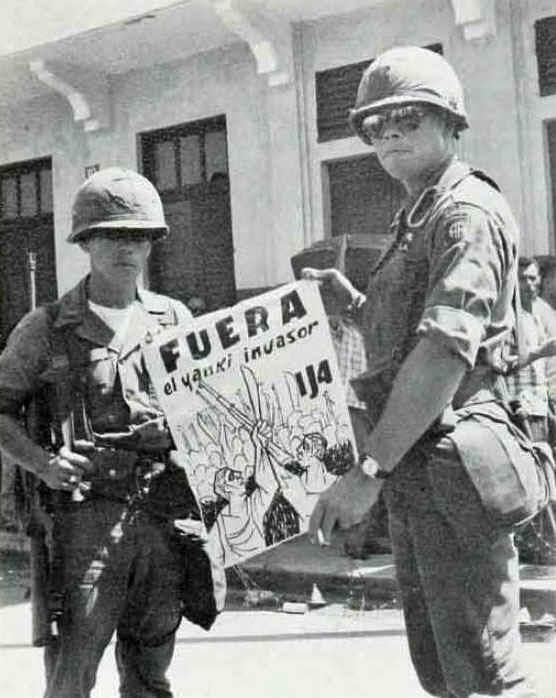 1st PSYWAR members distribute posters telling of the Communist Subversion of Latin America. A newspaper was printed in support of the Army operation by the USIS starting 5 May. 75,000 copies per issue were printed in Miami, Florida, and forwarded to the Dominican Republic for dissemination. 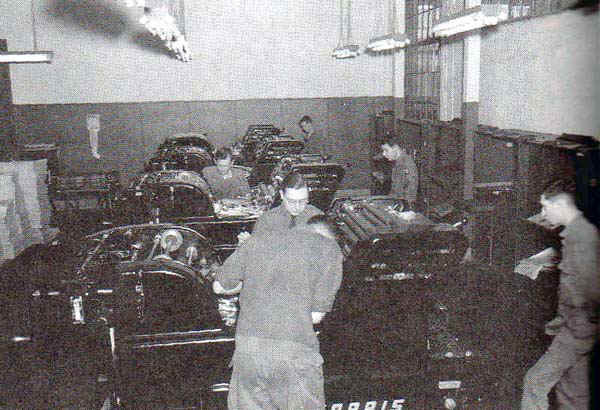 At the same time, to help support the Army printing on mobile presses, posters and pamphlets were printed by the USIA plant in Mexico City. Hewson A. Ryan, Associate Director USIA (Policy and Plans) was assigned the task of coordinating all PSYOP in the Dominican Republic. He had been involved in the Cuban missile crisis and as a result was aware of the need for air delivery of leaflets, radio and loudspeaker broadcasts. Cooper says that to assist him, the Army sent the entire 1st PSYWAR Battalion to Santo Domingo from Ft. Bragg, North Carolina, in early May. A temporary base of operations was set up in the home of the Public Affairs Officer near the American Embassy. The Battalion soon moved into a nearby school building. The Army supplied radio transmitters, mobile presses, multilith machines, loudspeaker trucks, and aircraft for leaflet and loudspeaker operations. Cooper says that the working relationships were particularly good and the military-civilian mix worked extremely well. Most of the Battalion and the heavy equipment returned to Fort Bragg by June. At that time, the priority changed from psychological operations to civil affairs and nation-building support. Two C-47 aircraft were assigned the task of dropping the leaflets and broadcasting to the people of Santo Domingo. Leaflets were also distributed by trucks and at certain designated locations. 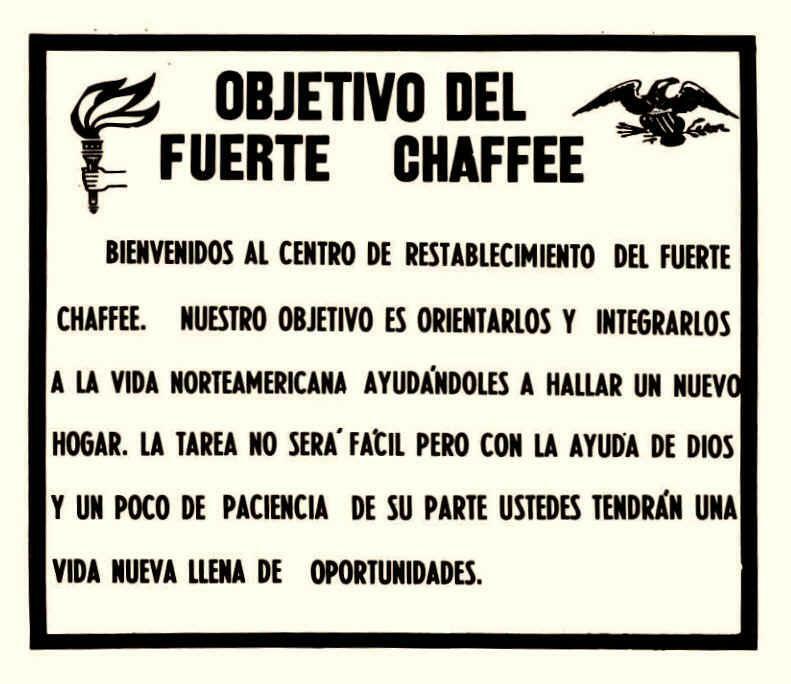 When those locations ran low, the leaflets were sold on the street by Dominican youngsters for a nickel each. One published report states that 70,000 leaflets a day were being printed by the end of May. 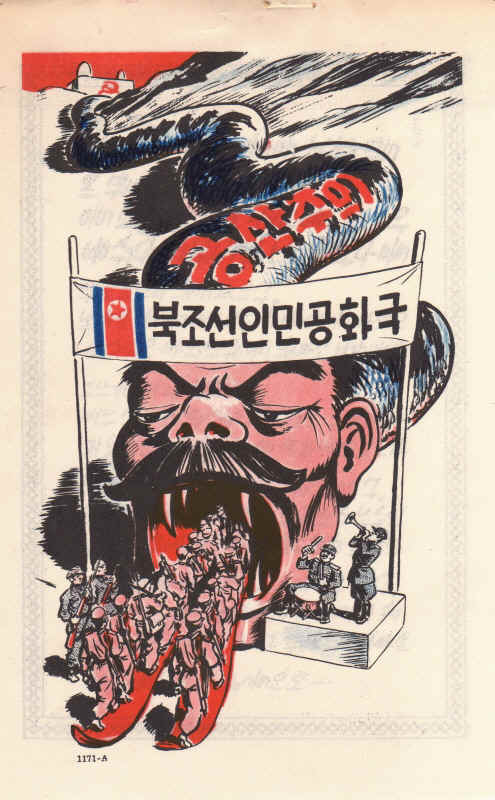 Army PSYWAR operators produced and distributed over two and a half million printed propaganda items. It seems apparent that the leaflets were dropped for a short period and probably only in and around the capitol city of Santo Domingo. LTC Moulis illustrates 10 such leaflets in his Military Review article. Most are plain text with symbols such as the flag or seal of the Dominican Republic. 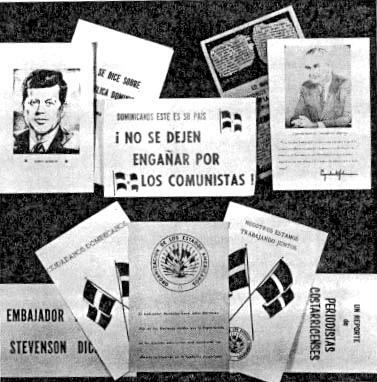 Two of the leaflets depict U.S. presidents; John F. Kennedy and Lyndon B. Johnson. 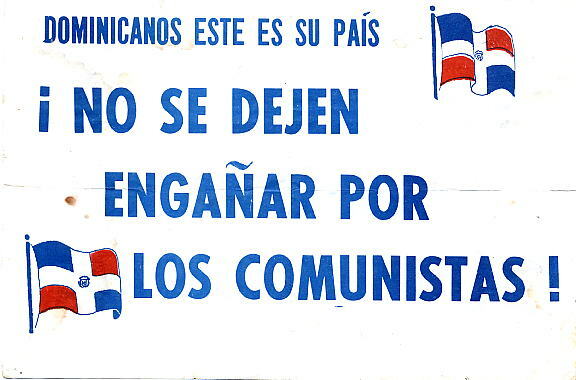 The titles of some of the leaflets are, "Dominicans this is your peace. Do not permit the Communists to deceive you!" "We are working Together," "Dominican Citizens" and "A Report by Costa Rican Journalists." The United States will give its full support to the work of the OAS and never vary from its commitment to preserve the right of all free peoples of this hemisphere to follow their own path without falling victim to the international conspiracy from wherever it comes. This is the TRUTH, the TRUTH about the American landing. The landing was made only for peaceful and humanitarian purposes. The landing was made only when the Dominican civil and military forces lost the ability to protect the lives of North American citizens and those of other nations. The United States government does not support any faction nor has it lent military aid or materials to any faction. The United States government only advocates the freedom and welfare of the Dominican people within a constitutional framework. The United States government has collaborated with the Red Cross to provide emergency aid all the Dominicans affected by the current crisis. The United States government is lending its entire support to the negotiations by the Organization of American States to solve the crisis. 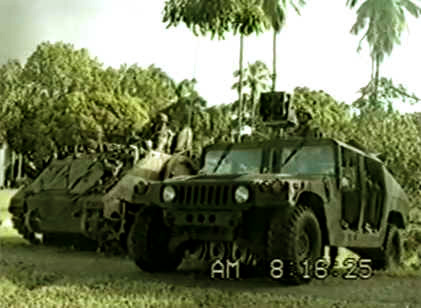 The 1st Psychological Warfare (PSYWAR) Battalion at Fort Bragg and the 1st PSYWAR Company (Field Army) had the necessary equipment to support USIS, but because the OPLAN called for the deployment of only a small, light mobile detachment, the company and the entire battalion did not reach the Dominican Republic until 7 May, and then largely at the insistence of Mr. Hewson Ryan, associate director of the United States Information Agency (USIA), who would direct all psychological operations in the Dominican Republic. When the 1st Psychological Warfare Battalion arrived in the Dominican Republic, it brought with it mobile printing presses, mobile broadcasting facilities, a loudspeaker capability to broadcast from trucks and from the two C-47s, and ultimately, heavy, mobile printing equipment. The loudspeaker trucks proved more effective than the aircraft in imparting information. Wherever the trucks would stop, hundreds of Dominicans would gather round to hear the latest news and receive leaflets and pamphlets, which by the end of May were being printed at a rate of 70,000 per day. On the whole, civilian-military cooperation in the psychological warfare effort was "remarkably successful." It was not, however, entirely devoid of friction. Besides feeling constrained by USIS control, 1st PSYWAR Battalion personnel believed that civilian agencies had little understanding of the military's capabilities. Conversely, civilian participants often complained about delays in the delivery of Army equipment and then about the outdated material and the poor quality of products they received. 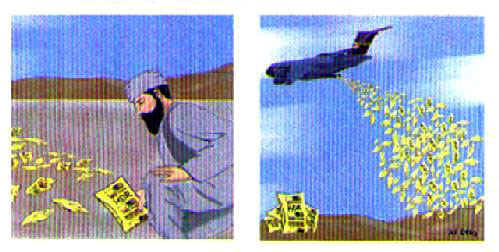 The two leaflets below were dropped during an early training scenario using U.S. Army Special Forces and Airborne troops. The local clans and families in Southwestern North Carolina were considered similar to the indigenous peoples of the Vietnam highlands, very tight-knit, so the Special Forces hoped to use them to test their strategy in building and training a guerrilla movement. They built relationships by helping the locals and working on their farms, A fish in the ocean as Mao wrote. Then, the United States sent the 82nd Airborne Division in to root the insurgents out. Please help us to help you. Each piece of information you supply to the 82nd Airborne brings you one step closer to that peace which we all so dearly seek. If you hear of a planned raid or something of that nature, dont hesitate to tell us about it. It may quicken the enemys downfall. It is your patriotic duty as loyal Fontana citizens to assist the 82nd Airborne, your friend in time of need, just as soon as you gain any information which may be of value to us. In 1965 the United States Army decided that since the psychological warfare units also took part in peaceful operations such as the humanitarian feeding of starving peoples, disaster relief and even nation building, the name would be changed to psychological operations. Thus, on 20 December 1965 the unit was reorganized and redesignated as the 1st Psychological Operations Battalion. I arrived at Fort Bragg in 1972 with orders assigning me to the 7th Special Forces Group (Airborne). At the One Stop in-processing Center I was asked if I could write. Thinking he was making a bad joke about my assignment to Special Forces I replied: Yes I can write and I can read too. The next thing I know my assignment was changed and I was assigned to the 1st PSYOP Battalion (Airborne). Vietnam was wrapping up and except for the various ongoing training exercises and keeping up with world events within our area of responsibility (SOUTHCOM), things were slowing down within the unit. Shortly after my assignment, Brigadier General Henry Hank - the Gunfighter Emerson, who had been the Commander of the USA John F Kennedy Center for Military Assistance and the US Army Institute for Military Assistance was promoted to Major General and assumed Command of the 2nd Infantry Division in South Korea. He quickly identified problems within the Division to include racial discord, High VD rates and low morale. General Emerson contacted his old friend, Colonel William Wild Bill Hudson, Commander of the 4th PSYOP Group and asked if he could possibly conduct a peacetime study to examine the stressors and problems of his soldiers and come up with a program to improve the standard of living. Thus Project Life was begun. We must have done something right as the overall division morale increased as racial incidents, drug usage and the high VD rate all dropped. A couple years later, Television public service announcements began urging Americans To Get High on Life and to look at alternatives such as sports and other recreational activities rather than drugs and how everyone should work together in racial harmony. I always wondered if some public relations outfit stole our program to use on the American public. We were testing different types of paper for use in printing leaflets. One type was a paper that could be used for leaflets disseminated during training exercises. The paper was made to break down quickly after being wet. To demonstrate the capability of this paper we placed samples in jars showing how the paper broke down day by day after being exposed to water. Another was a paper that could not be torn. It looked and felt similar to regular paper but it was developed to frustrate the enemy. We were looking for a unique way to demonstrate the use of this paper and challenged the printers to come up with a unique idea. Realizing that one of the pressmen had met the challenge, I told the Congressmen: Tear up the card! They all stared at me with quizzical looks and attempted to tear the cards. Despite their best efforts not one was able to tear apart a card. They looked at each other and then turned to me asking if they could have all the cards. The pressmans innovative idea turned out to be the hit of the Congressional visit. Every few decades, like lemmings running to the sea, the Army sets forth on a self-destructive action called Reduction in Force (RIF). Bright young officers are basically thrown away because of a failure to meet certain rank levels or other criteria and the service suffers greatly. Another officer told me about the time a RIF hit the 1st PSYOP Battalion. 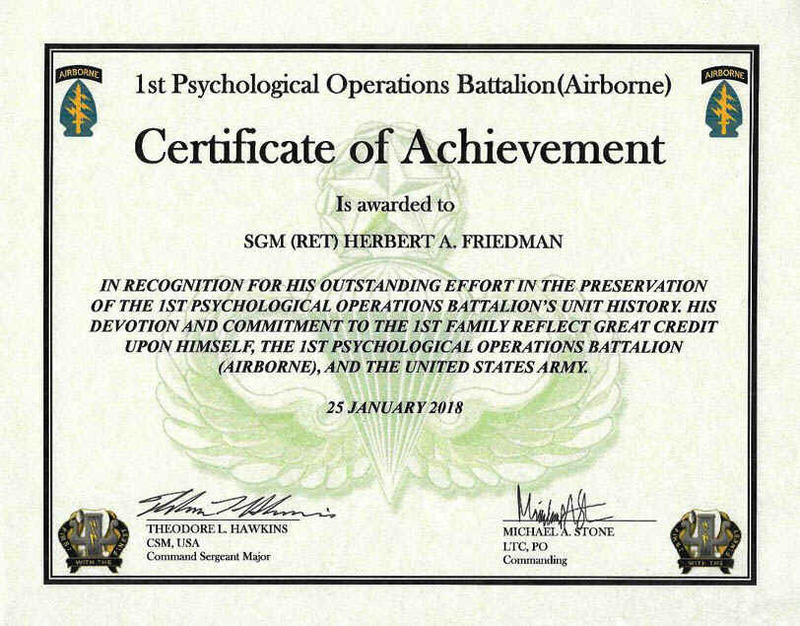 In 1974 I was a 2nd Lieutenant assigned as a PSYOP officer to the Plans and Operations (S3) section of the 1st Psychological Operations Battalion (Airborne). The big topic on everyone's mind was that of the upcoming Reduction in Force (RIF) which was intended to draw down the size of the active duty officers. When the RIF arrived, the 1st PSYOP Battalion took a surprisingly large hit. We lost our S1 (Personnel - Captain), S2 (Intelligence - Captain), the S3 (Operations - Major), the Assistant S3 (Operations - Captain), Air (a Captain) and the S4 (Logistics - Captain), Our 1st PSYOP Battalion staff after the RIF consisted of a 1st Lieutenant as the S1, a 1st Lieutenant as the S2, myself, a 2nd Lieutenant as the S3, and a Warrant Officer 01 as the S4. While deployed to Key West, Florida for a major Field Training Exercise, SOLID SHIELD 80, the Battalion was alerted and deployed one Operational Detachment (OPDET) to Ft. Chaffee, Arkansas. This humanitarian effort took place from 8 May to 22 August 1980. .The Operational Detachment performed all tasks in a truly outstanding manner while operating in an austere and, at times, hostile environment. The number of Army Commendations and other Service Medals awarded to the men and women of the Operational Detachment bears witness to their dedication, hard work and devotion to duty. Their effort, unparalleled since the Vietnamese Resettlement Operations, stands as a model of professionalism and personal sacrifice. On 4 April 1980, the Cuban government suddenly removed obstacles in front of the Peruvian Embassy in Havana, Cuba. The obstacles had been constructed to prevent the forced intrusion of Cubans desiring asylum. The Cuban government also removed the military police and gate guards who had routinely blocked the embassy's entrance. A crowd of more than 10,000 Cubans eventually occupied the grounds of the Peruvian Embassy. Meanwhile, the Cuban exile community in Miami explored other possibilities. On 6 May Major James Fouche, 1st PSYOP Battalion, was ordered to Ft. Chaffee as the battalion advance party and assessment Team. On 7 May 1980, Operational Detachment II, 1st Psychological Operations Battalion, was alerted for deployment to Ft. Chaffee, Arkansas. The 27-man detachment deployed the same day on C-130s.  support in and out processing through the use of printing, loudspeaker and language capabilities.  train the detachment in PSYOP skills, i.e., the art of persuasion and influencing people.  improve language skills and area knowledge of Cuba.  collect information of a PSYOP nature. Welcome to the Resettlement Center at Fort Chaffee. Our object is to orient and integrate you into the American way of life and help you find a new home. The task will not be easy but with Gods help and a little patience on your part you will have a new life full of opportunities. A Spanish language newspaper entitled La Vida Nueva (The New Life) was published. Specialist 5 John Mullins was appointed as the newspaper's editor. Its primary purpose was to inform, educate and entertain. The first publication date was on 10 May 1980. There was no formal tasking to publish a camp newspaper. However, there existed an immediate and obvious need which the 1st Battalion's PSYOP detachment was fully prepared to meet when it arrived on the morning of 8 May, 1980. Refugees began arriving by the thousands the very next day. They were confused, frightened and uninformed. They had no idea where they had been brought or what they could expect from the American military. After a brief meeting between the PSYOP detachment commander and the Fort Chaffee Public Affairs Officer the idea for La Vida Nueva (The New Life) was conceived. There was no formal tasking to publish a camp newspaper. However, there existed an immediate and obvious need which the 1st Battalion's PSYOP detachment was fully prepared to meet when it arrived on the morning of 8 May, 1980. Refugees began arriving by the thousands the very next day. They were confused, frightened and uninformed. They had no idea where they had been brought or what they could expect from the American military. After a brief meeting between the PSYOP detachment commander and the Fort Chaffee Public Affairs Officer the idea for La Vida Nueva (The New Life) was conceived. Additionally, 500 copies a day of the Diario Las Aroericanas, a Miami Spanish language newspaper, began to arrive. These two publications greatly improved the refugees access to information via printed media. An FM radio station was also put into service. A camp Public Announcement system was established. The organization of the Vida Nueva staff was simple and based on available resources. The staff began with an editor and 3 Operations Detachment members who all wrote, translated, typed and reported. At that time the Operations Detachment Commander, along with the detachment's best linguist, edited. 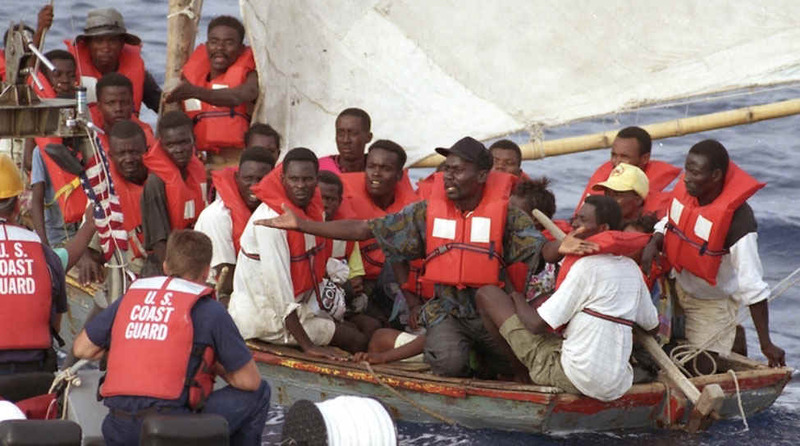 With the recruitment of Cuban staff members, the staff gradually totaled 16 refugees and 5 Operations Detachment members. The five U.S. personnel held the following positions: editor; assistant editor; interpreter; typist and chief reporter. The 16 refugees consisted of 4 typists, 7 translators and 5 reporter/photographers. The Printing and Graphics Section printed the newspaper and numerous other items. Their totals for May 1980 are: Printing Projects completed  250, Items produced - 560,000. Graphics Projects completed  115, Items produced - 280,000. There was also an Audio-Visual section. The section initially consisted of one NCOIC and 6 enlisted men. The audio-visual section had three distinct missions: loudspeaker operations, movie projection and recording. Loudspeaker broadcasts comprised 90% of total missions conducted. Vehicular mounted loudspeakers proved especially effective for crowd control. The 1st PSYOP Battalion also conducted a helicopter mission with one member of the loudspeaker team operating from a UH-1H with a loudspeaker and linguist. The helicopter mission lasted approximately four hours. Opening ceremonies for Radio Station KNJB (frequency: FM 92.7 mhz.) at Fort Chaffee commenced at 1200 hours, 12 June 1980. Approximately 600 radios were distributed among the Cubans by FEMA: one per barracks floor, one in each recreation room and one to each mess hall. The station was "on the air" from 1200 to 2300 daily. The Federal Emergency Management Agency (FEMA) obtained, in record time, a license from the FCC. The station ran on 10 watts, which was just enough power for the immediate Fort Chaffee area. The call letters were KNJB and the frequency was FM 92.7 mhz. The initial mission was to inform, educate and entertain Cubans within the camp. The need to communicate detailed instructions on short notice was critical. Programming involving camp activities and out-processing procedures was given priority. Educational programs included English lessons and programs aimed at familiarizing the Cubans with the American way of life. Entertainment consisted primarily of music and news. In Cuba toilet paper is not thrown into the toilet because it would stop it up. 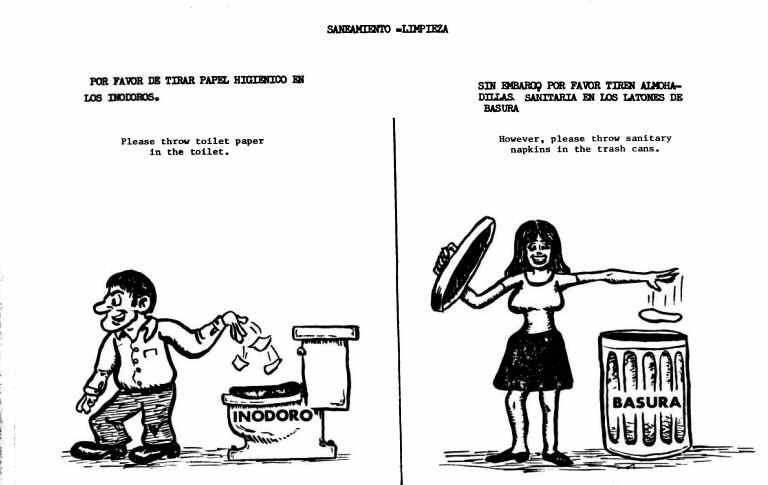 This leaflet explains that toilet paper goes into the toilet and sanitary napkins go into the trash can. LESSON LEARNED: A "reeducation" program is necessary to inform refugees of how to use plumbing and general information on sanitation. This can be done through the use of native language posters, signs, etc. In future operations, native language signs and posters should be made up describing use of plumbing and sanitation in advance of their arrival. Welcome to the United States of America. My name is Cheo. You will see me and some of my friends here every day. I'm going to teach you English and talk about some of the North American customs. Again, welcome and good day. See you tomorrow. This thing is enough to drive anyone absolutely crazy. On a personal note, as I wrote this article I remembered that I spent some time at Indiantown Gap back in the 1980s. It was not quite as warm and cozy as much of the official after-actions state. I remember that the Cubans were placed at the end of the base in an out-of-the-way area, and there were multiple rows of barbed wire and plenty of MPs. There had been riots and demonstrations and the Army was treating the Cubans, many of which were criminals released from Castro's jails, as dangerous people. There were multiple rings of barbed wire and it looked almost like a high security prison camp. I paid no attention at the time because I was on other business, but I do remember going through checkpoints at that end of the base. The general conduct of Cuban arrivals here at Fort Chaffee has been good. Despite tight and crowded living conditions at Fort Chaffee, you have been patient and understanding when the waiting lines are long. You have realized that we are trying to do our best to make your stay at Fort Chaffee as pleasant as possible under the circumstances. First, the cleanup of living and camp areas is your responsibility. Do not throw papers and trash on the ground in the area. Pick up papers, milk cartons and paper plates you see lying on the ground and put them in the trash cans or in the plastic bags to be taken away. Keep your new temporary home clean. Second, some members of your community have been arrested outside of the limits which were established for you. You MUST stay within the roped off area except when escorted to other processing points. This must be made clear to every Cuban arrival. Because of the misconduct of some of your number in leaving this area, you are losing the good will and welcome of the local population. Those who violate the roped-off limits are subject to prosecution in a court of law and your processing and departure from Fort Chaffee will be delayed. For your safety and so that you may become citizens of the United States soon, do not leave the roped off area. On an entirely different subject I should mention that the 1st PSYOP Battalion also got involved with the settlement of Vietnam refugees in the U.S. after the Vietnam War in operations called NEW LIFE (Guam and Wake Island) and NEW ARRIVALS (In the continental United States) in 1975 and 1976. 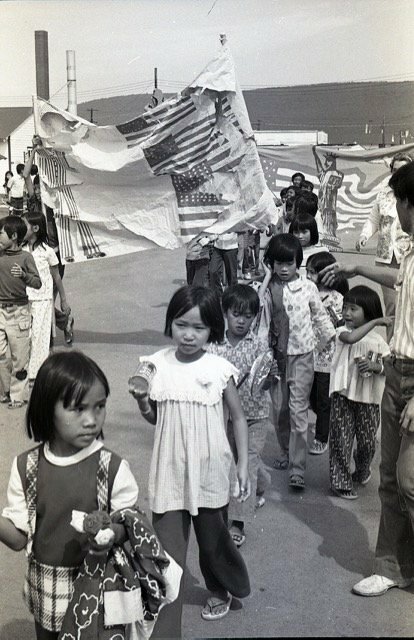 After the fall of Saigon on April 30, 1975, Fort Indiantown Gap in Lebanon County became a resettlement and processing center for thousands of Vietnamese and Cambodian refugees. In late April 1975, the North Vietnamese Army was approaching Saigon, the capitol of South Vietnam. United States President Gerald Ford ordered all American civilians to evacuate along with South Vietnamese refugees. What followed was a massive airlift with U.S. Marine and Air Force helicopters of about 1,000 American civilians and 7,000 refugees. 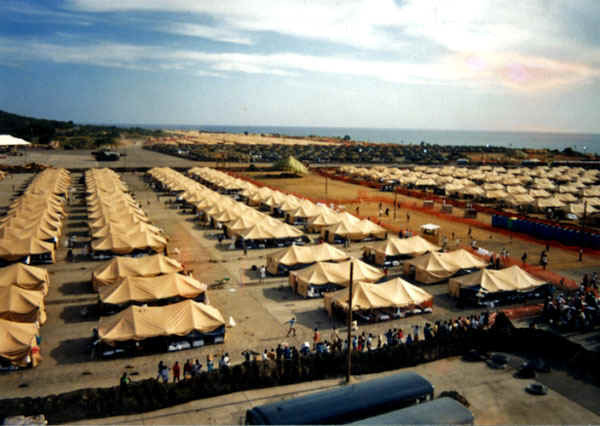 The refugees first went to relocation processing centers in Guam, the Philippines, Thailand, Wake Island and Hawaii before being flown to the four resettlement centers in the United States at Camp Pendleton in California, Fort Chafee in Arkansas, Eglin Air Force Base in Florida and Fort Indiantown Gap. At Indiantown Gap, contractors raced to renovate deteriorating barracks, mess halls and administrative buildings at the Gap that suffered from outdated World War II construction. The base was turned over to the Department of Defense in May of 1975 to support the refugees. The refugees were given ID and meal cards. They underwent physicals and, the children, immunizations. Families were randomly assigned to barracks, which were outfitted with partitions that were adjusted to fit families of different sizes. The Vietnamese arrived classified as "refugees" and were immediately eligible for Medicare/Medicaid, welfare, and food stamps. They were given this status by the Attorney General under powers granted to him by the Immigration and Nationality Act of 1952. By December, there were 74 weddings, 128 births and 10 deaths. During the day, sewing and craft classes were offered, as were classes that taught English. In the evening, films were screened on a projector outdoors. As one might expect, communication with the refugees soon became a major problem. In view of the fact that most of the American personnel engaged in operating the FORSCOM camps had no knowledge of either the Vietnamese or Cambodian languages and the number of qualified linguists was limited, both Fort Chaffee and Fort Indiantown Gap published national language newspapers to carry announcements and other items of general interest. These newspapers were produced by psychological operations personnel assigned to the centers. In addition, at Fort Chaffee, psychological operations personnel, augmented by Vietnamese volunteer refugee personnel, operated a Vietnamese language radio station. Although both of these imaginative programs were instrumental in improving communication, the language problem continued to cause a general slowdown in out-processing. My military occupational specialty was 71L (Administration) of the Army Security Agency where I was a Vietnamese Voice Intercept Technician  Northern Dialect. I served two tours in Viet Nam, and passed two language courses in Vietnamese, both Basic and Advanced). Back in 1975 I knew that the Republic of Viet Nam would fall. Once the North Vietnamese Army overran the South Vietnamese Army 5th Division in Quang Tri Province, and the officers and Non-commissioned officers retreated from Ban Me Thout, it was almost over. I was stationed at Aberdeen Proving Ground and plodding through my Army career. We received a message at Aberdeen saying that the Army would be opening refugee camps across the U.S. One of which was to be at Fort Indiantown Gap, PA about 90 minutes from Aberdeen. I called the point of contact at Fort McPherson, Georgia, and explained my qualifications: Vietnamese language school; two tours in Viet Nam. They immediately accepted me for temporary duty at the Gap. In late May 1975 I drove to the base there and reported for duty. During my stay in Pennsylvania I did not take part in much in the way of psychological operations. It was mostly caring for the refugees, making public service announcement, translations and the playing of Vietnamese music over the loudspeakers which always had a calming effect. My duty there came to an end in November, 1975. For my service there I received the Joint Service Commendation Medal and the Humanitarian Service Medal. 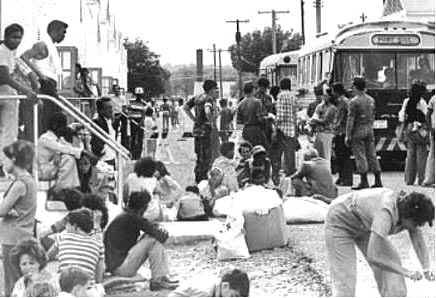 For eight months, more than 32,000 Vietnamese and Cambodian refugees were resettled at Indiantown Gap. The refugees were housed in Army barracks whose interiors have been partitioned to give some measure of privacy to the families. Americans were not allowed in the barracks unless invited by one of the Vietnamese families. The resettlement of the refugees in the United States was handled by eight volunteer agencies. These agencies played a major role in resettling the refugees by matching them with specific sponsors such as churches, individuals, or community groups. for the Southeast Asia refugees housed there after the fall of Saigon. 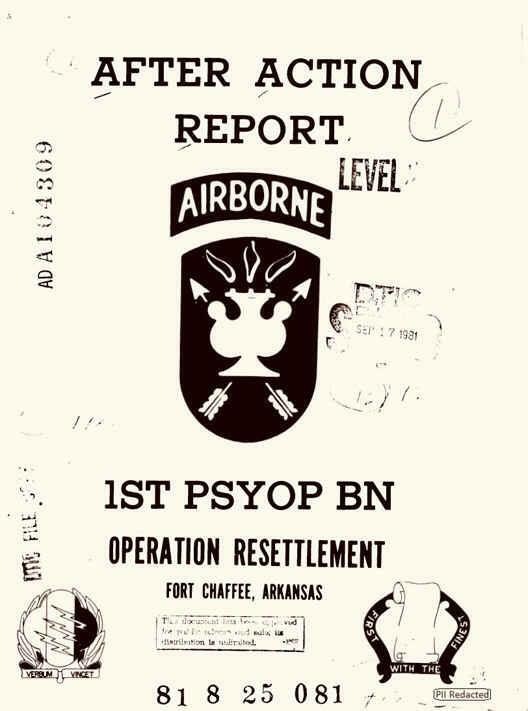 PSYOP troops printed the newspaper Dat Lanh (New Land) daily in Fort Indiantown Gap, Pennsylvania and Fort Chaffee, Arkansas in Vietnamese and English. One issue of the newspaper stated that the Vietnamese population of the Pennsylvania camp would end 30 November 1975. A later issue said the camp would not be closed until it reached a zero Vietnamese population. All the refugees at the Gap were to be out-processed through the normal voluntary agencies which would place them with sponsors. 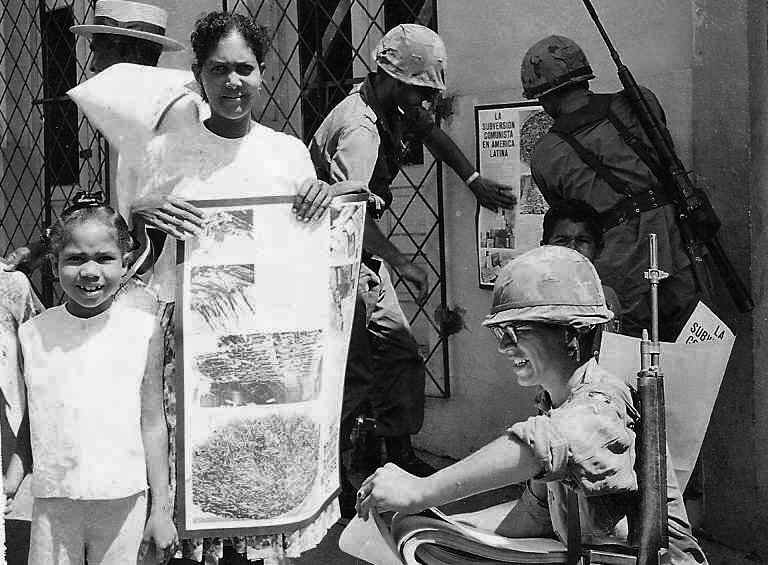 In conclusion, at both Army bases, as well as on Guam and at Eglin Air Force Base, detachments from the Army's 4th Psychological Operations Group from Fort Bragg printed leaflets, signs, and menus for the benefit of the Vietnamese and Cambodian refugees and, most importantly, prepared daily newspapers for the evacuees in their vernacular. This action enabled the refugees to be kept current on events in the outside world and supplemented their information within the center. The unit next saw action in Operation Urgent Fury in Grenada in 1983. The Grenada story began on 13 March 1979 when Maurice Bishop overthrew the legitimate government and established a communist society. 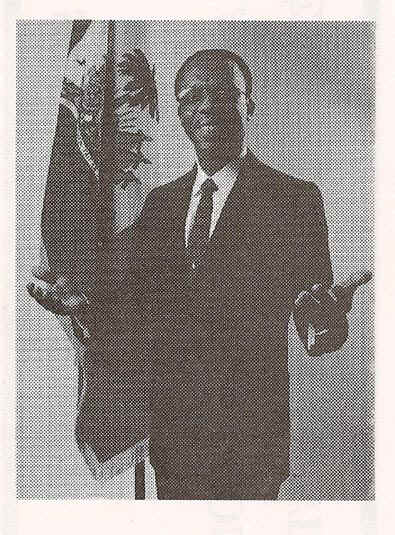 The New Joint Endeavor for Welfare, Education, and Liberation (New Jewel Movement) ousted Sir Eric Gairy, Grenada's first Prime Minister, and established a people's revolutionary government. Grenada began construction of a 10,000 foot international airport with the help of Cuba. There was speculation that this airfield could be used to land military fighters and transports, threatening South America and the southern United States. President Ronald Reagan accused Grenada of constructing facilities to aid a Soviet and Cuban military build-up in the Caribbean. There was also worry about the large number of weapons flowing into Grenada. 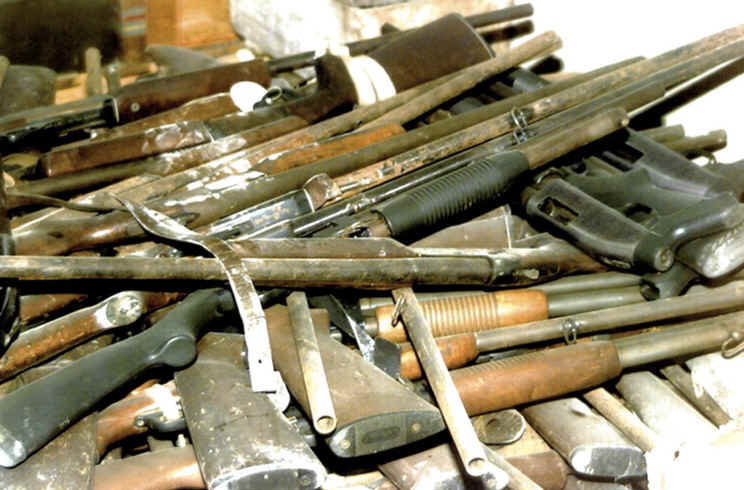 One shipment in 1979 contained 3400 rifles and 3 million rounds of ammunition. In addition, there were about 600 American medical students studying in Grenada and another 400 foreign citizens. The safety of these Americans became a factor when Maurice Bishop and several members of his cabinet were murdered by elements of the people's revolutionary army on 13 October 1983. The even more reactionary and violent Deputy Prime Minister Bernard Coard who led a Marxist-influenced group within the Grenadian Army replaced Bishop. President Reagan called the leaders of the new government "a brutal group of leftist thugs." 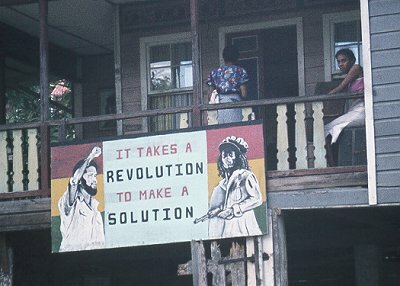 The United States reacted to the bloody coup in Grenada within two weeks. On 25 October 1983 American troops landed on the beaches of Grenada. They were assisted in part by members of the Organization of Eastern Caribbean States (OECS), specifically Barbados, Jamaica, Antigua, Dominica, St Lucia and St Vincent. They were opposed by Grenadian and Cuban military units and military advisors from the Soviet Union, North Korea, East Germany, Bulgaria, and Libya. The Joint Psychological Operations Task Force electronically transmitted its initial leaflet with directions for its production and dissemination to the aircraft carrier USS Guam. After printing on the Guam, Marine helicopters distributed 50,000 leaflets as Marine forces landed in Grenada. 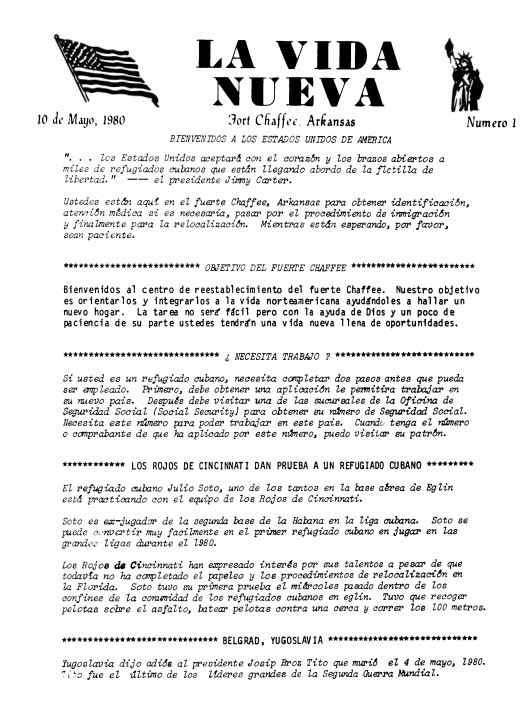 Permanent presses at the 4th Groups headquarters at Fort Bragg, NC, printed and packaged leaflets targeting both the Grenadian population and Cubans on the island. Air force MC-130 aircraft dropped 300,000 of these in the St. Georges area and along the western coast on the second day of hostilities. 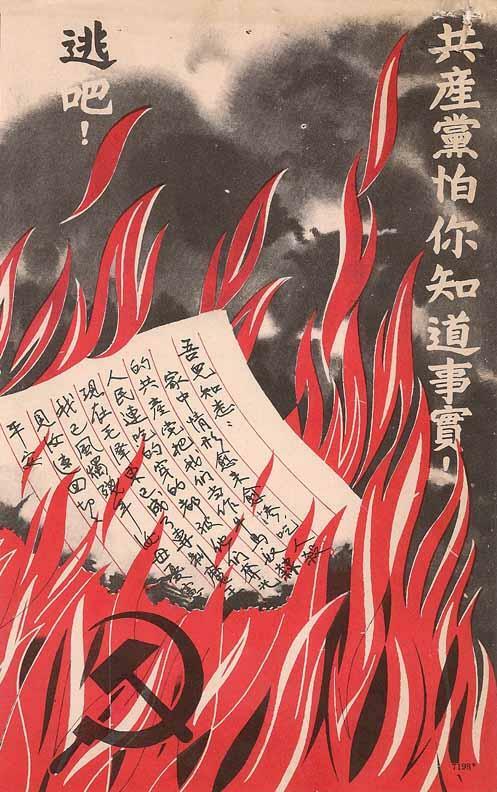 Between 25 October and 8 December the PSYOP task force produced and disseminated more than 900,000 leaflets, handbills, and posters. I note that although the 1st PSYOP Battalion was the Armys PSYOP proponent in Grenada it is seldom mentioned by name. For the most part we find that its parent organization, the 4th PSYOP Group is mentioned. 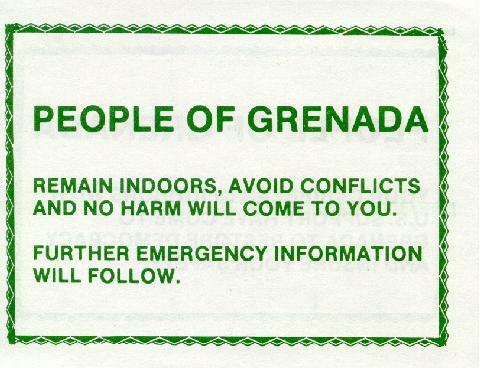 People of Grenada. 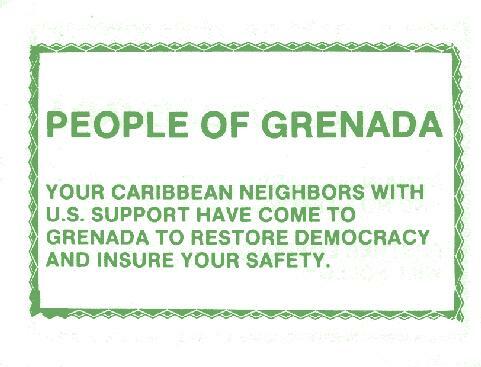 Your Caribbean neighbors with U.S. support have come to Grenada to restore democracy and insure your safety. Remain indoors, avoid conflicts and no harm will come to you. Further emergency information will follow. Your defeat is inevitable. You are facing thousands of troops from six different countries. Cease resistance and return to Cuba with honor where your family awaits you. 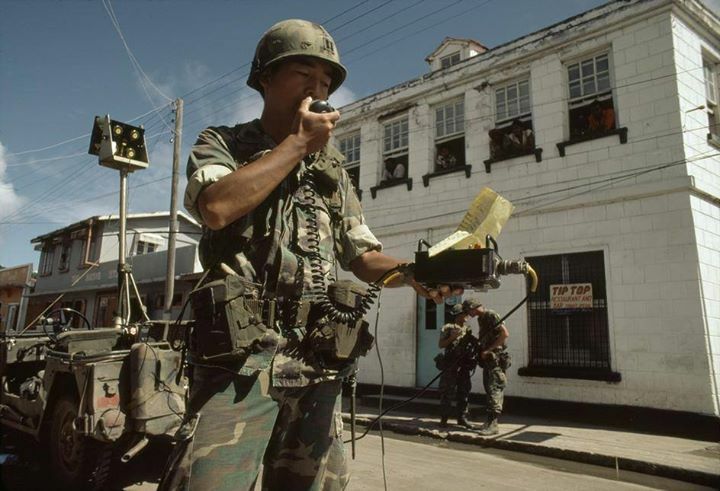 During Operation Urgent Fury, the U.S. invasion of Grenada, tactical PSYOP teams played an important role by broadcasting surrender appeals to both Grenadian soldiers and their Cuban advisors. These loudspeaker broadcasts helped lower the number of combatants U.S. forces faced. Leaflets dropped across the island combined with broadcasts from Air Force Volant Solo aircraft and land based radio transmitters lowered the incidents of civilian casualties during the fighting to liberate the island. Eventually PSYOP forces were broadcasting to the island for 11 hours per day. These broadcasts in conjunction with vehicle mounted loudspeakers were used to for consolidation activities. 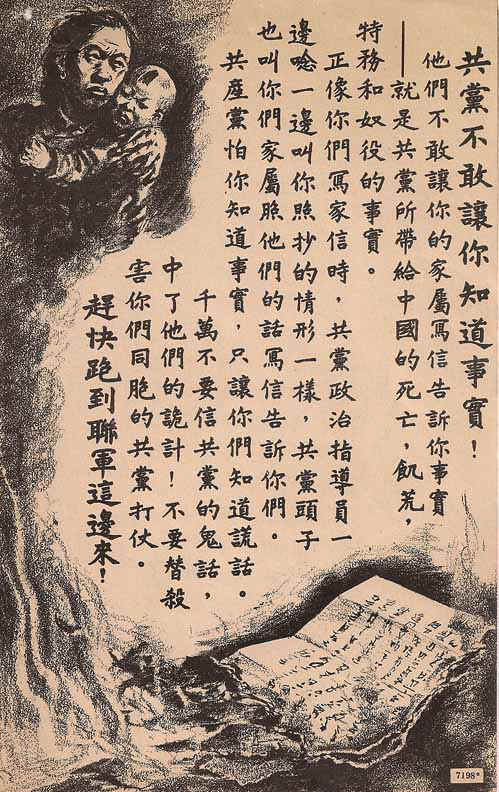 Leaflets directing the populace to remain indoors and tune their radios to a specific frequency were designed by the Army and printed aboard Navy ships. 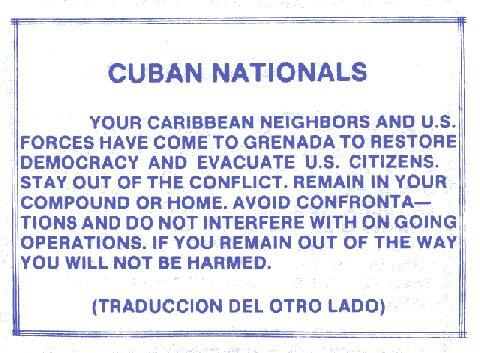 Other leaflets produced both at Ft. Bragg and on the island, were effectively used during the consolidation operations to encourage Grenadian civilians to report information concerning People's Revolutionary Army (PRA) and Cuban soldiers. From October 1984 to July 1993 the 1st PSYOP Battalion was active in conducting Civil Military Operations (CMO) in countries such as El Salvador and Haiti. It provided Peacetime Psychological Operations Programs to the Government of El Salvador during its counterinsurgency effort. It also provided post-war Humanitarian and Civic Assistance to El Salvador, building roads, digging wells and medical readiness training exercises. 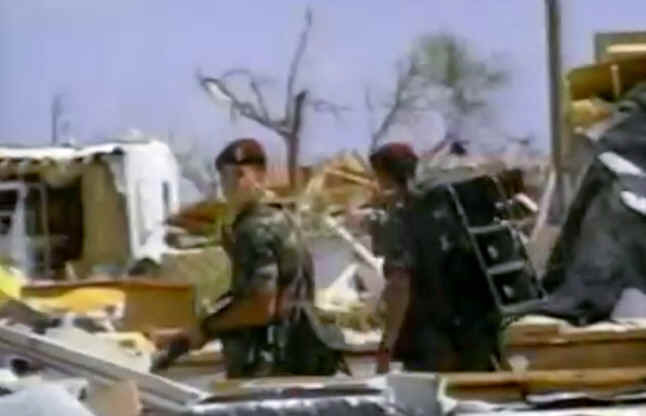 The Battalion also provided support to Joint Task Force Aguila in its disaster relief efforts during the wake of Hurricane Mitch. Specialist Four J. Scott Bowman was a 96B (Intelligence Analyst) and a 96F (Psychological Operations specialist) and a member of the 1st PSYOP Battalion who deployed to Panama, El Salvador and Grenada. He was promoted to sergeant in June 1984. He told me about what he did in Central and South America and I thought I would add some of it here just to show the wide spread of jobs that are available to PSYOP troops. He joined the Army in 1982 and took Basic Training at Ft. Leonard Wood, Missouri. He was granted Top Secret security clearance and sent to Ft. Huachuca for Intelligence Analyst (96B) training. He was assigned to the 4th PSYOP Group, 1st PSYOP Battalion at Ft. Bragg, NC. He was sent to Panama in April, 1983 as a Private First Class on a 3-month temporary duty (TDY) assignment which extended into a 6-month tour. He spent most of his time in Panama gathering intelligence for use in Psychological Operations for the Southern Command region. He flew with the crew on Coronet Solo to evaluate dissemination capabilities for the airborne platform. The Coronet Solo was a modified C-130 that the Air Force used for civilian broadcasts in radio and television. The airborne radio and television broadcast mission originated in the mid-1960s with the EC-121 (known as Coronet Solo). The mission later transitioned to the EC-130E (1980). Other variations of the aircraft were Volant Solo and Commando Solo. He flew in the aircraft to see if it could be a platform in Psychological Operations for Southern Command implementation. He later filed a hand-written report on its capabilities and forwarded it to his headquarters. 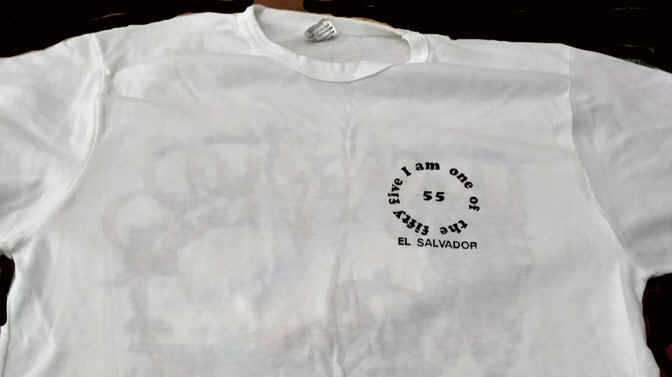 PSYOP created these for the Department 5 personnel in El Salvador. The idea was to hand them out and spread the word in the Armed Forces that PSYOP was there. Military involvement in El Salvador was limited by Congress to just 55 advisors on the ground. They didn't want another Vietnam escalation. Of course, there were ways around that. Bowman was never counted as one of the 55 because he was on a TDY assignment and never permanently assigned. He was sent TDY to El Salvador 3 times during this period and helped to establish a Psychological Warfare branch for the El Salvador Armed Forces (Department 5). 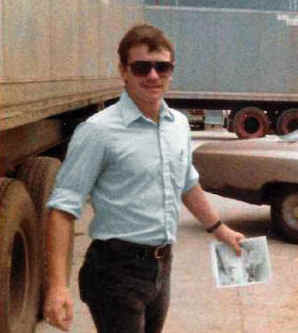 He returned to Ft. Bragg in September, 1983. He was promoted to Specialist 4 in October, 1983. I was deployed a second time to Panama in April 1984 on a 3-month TDY assignment which extended into a 6-month tour. I continued my assignment of gathering intelligence for use in Psychological Operations for Southern Command. I was also Sent TDY to El Salvador on two month-long deployments. While there I wrote a 34-page Amnesty program outline that was submitted to the EL Salvador Armed Forces for execution. I understand that President Duarte integrated a few of these principles into the Amnesty plan that he implemented. The badge was designed by U.S. Army Major Howard Anders. He had it officially recognized and wore it on his BDU's. I don't know if he ever had a Class A version authorized. I was assigned to and Graduated from the El Salvador Psychological Operations course. I and Specialist 4 Roberto Reyes were the first two Americans to graduate from this new course and be issued the badge. 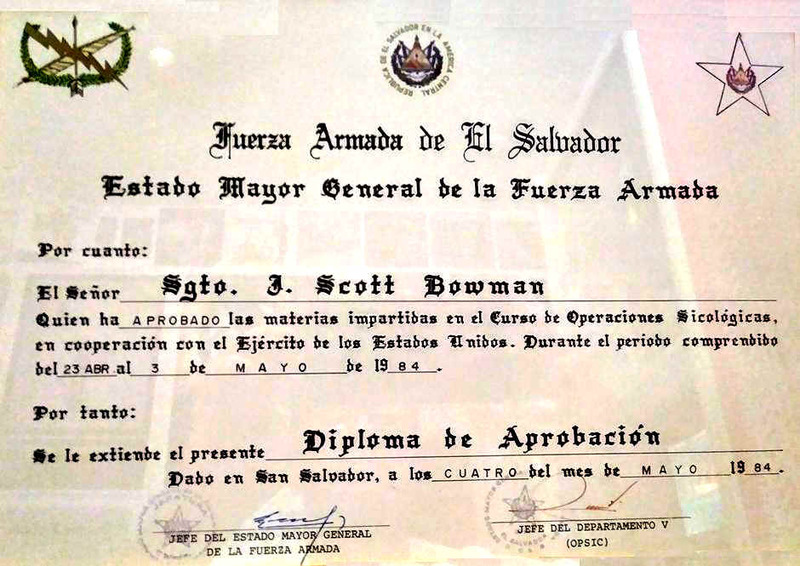 This diploma from the General Staff of the Armed Forces of El Salvador says that Sergeant J. Scott Bowman has mastered the subjects taught in the course of psychological operations in cooperation with the Army of the United States. I spent most of my time in El Salvador training civilian personnel on Psychological Warfare practices for the newly established Department 5 of the El Salvador Armed Forces (ESAF). My remaining time In Panama was spent gathering intelligence to be used by Department 5 in El Salvador. 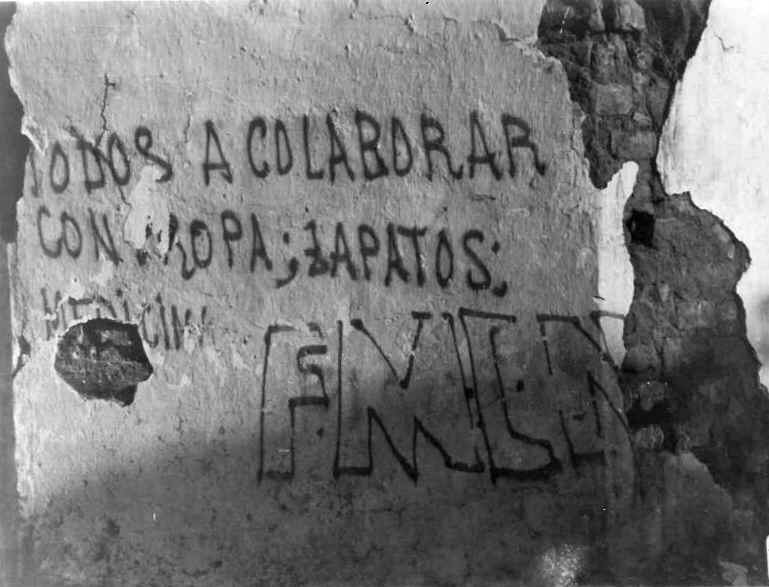 In 1984, the Defense Intelligence Agency sent unclassified photographs of enemy graffiti to the El Salvador armed forces to study, and from there they were sent to Department 5.This was an efficient way for the enemy to present propaganda to the people; spray paint cans were extremely cheap and effective propaganda tools. As you can see, the life of a PSYOP trooper is not just drawing leaflets and tossing them out of aircraft. There are a lot of schools to attend and a lot of different missions that require numerous different talents. This exhibit produced by the U.S. Armys 1st PSYOP Battalion to display their products depicts leaflets, posters, books, newspapers, magazines, records, calendars, cups, backpacks, book bags, shopping bags, T-shirts and other items. The nations targeted in this display are Guatemala, El Salvador, Ecuador, Columbia, Peru and Bolivia. Some of the themes are eradication and interdiction of drugs, development of other crops, humanitarian mine assistance, nation building, and human rights. The entire Southern Command area of responsibility includes the landmass of Latin America south of Mexico; the waters adjacent to Central and South America; the Caribbean Sea, its 12 island nations and European territories; the Gulf of Mexico; and a portion of the Atlantic Ocean. It encompasses 32 countries (19 in Central and South America and 12 in the Caribbean) and covers about 15.6 million square miles. 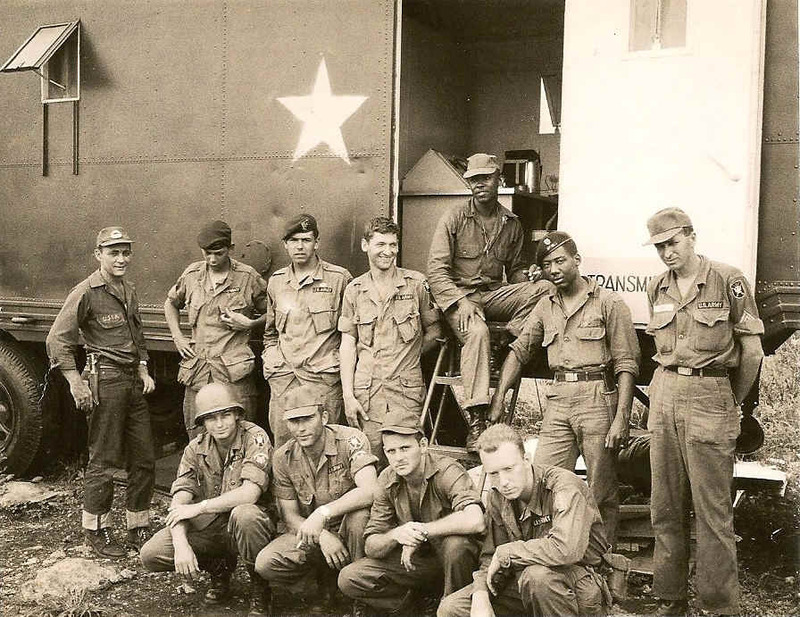 The 1st PSYOP Battalion had a Forward Support Detachment consisting of 32 soldiers stationed in Panama. 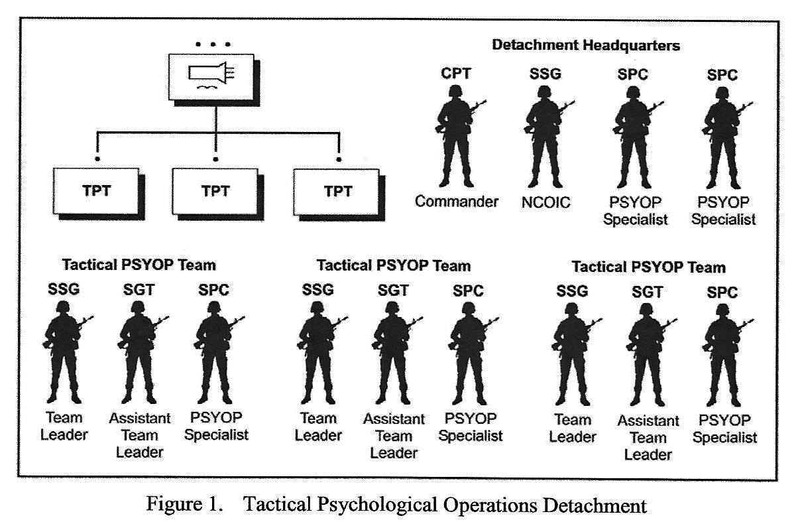 Alpha Company of the 1st PSYOP Battalion was subdivided into a Strategic Studies Detachment (SSD); a Propaganda Development Center (PDC); a Printing Press unit; and a tactical Operations Detachment (OpDet). I served for a time in all Alpha Company units except the print plant. The SSD, staffed by approximately 50 soldiers, conducted long-term studies of sensitive foreign countries and deployed primarily to El Salvador to assist the PSYOP effort during that nations civil war. With about 40 soldiers, the PDC largely operated in Honduras, trying to influence both Honduran attitudes and nearby events in Nicaragua. 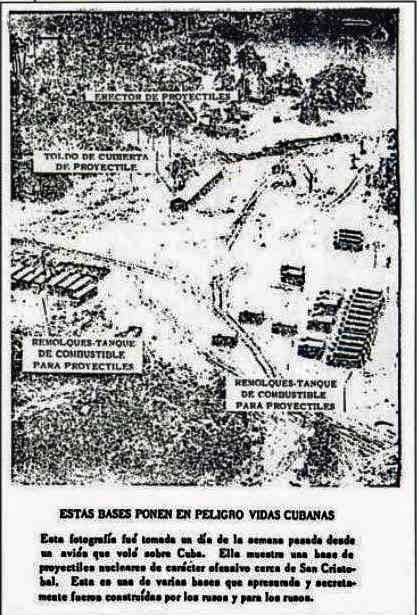 The PDC also collaborated in developing propaganda with the Peruvian Armed Forces, although this work was largely undertaken at Fort Bragg itself. By the late 1980s, the battalion was operating in El Salvador, Honduras, Peru and Panama, countries sharing similar histories of military interference in civilian affairs and human rights abuses. Denounce trafficking, criminal activities, and violations of human rights. It puts the lives of others at risk. Speaking of Panama in 1988, SP4 Matt Robbins, a former member of the 1st PSYOP Battalion wrote to me with an interesting anecdote. His detachment was in Panama but keeping a low profile. The troops were told to move about quietly and draw no attention to themselves. So, as a gag, the men decided to become the 1st U.S. Army Surf Team. They made a sign and put on the door of the attic where they were quietly bivouacked. They also printed certificates as souvenirs of the operation. Not exactly a low profile, but close. 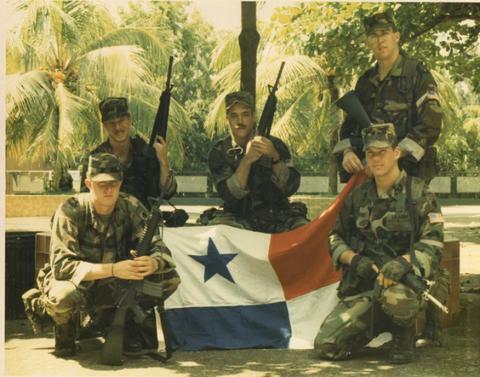 In 1989, the 1st PSYOP Battalion was deployed to Operation Just Cause in Panama. 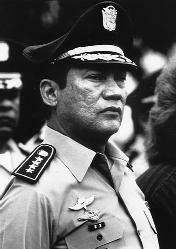 In 1983, Manual Noriega became chief of staff to new strongman General Dario Paredes. He later succeeded Paredes and promoted himself to general in that same year. He led Panama from 1983 to 1989. American sources alleged that he had been a paid CIA informant and on the United States Army's payroll from 1955 to 1986. He was also accused of being a double agent who sold American secrets to Cuba. There were strong rumors that Noriega was channeling Columbian cocaine through Panama to the United States. As a result, the United States indicted him on drug-trafficking and racketeering charges in 1988. What is not commonly known about Noriega is that he was a student and graduate of the U.S. Army Psychological Operations School. According to the authors of Operation Just Cause, Lexington Books, NY, 1991, The U.S. Army Southern Command had logged more than one thousand incidents of harassment by the Panamanian forces since 1998. American newspapers clamored for military action. President George Bush ordered the Joint Chiefs of Staff to prepare for a Panama invasion. 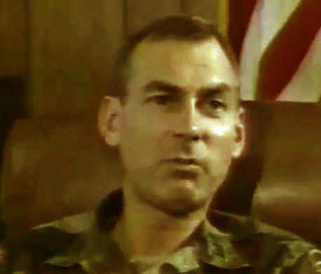 The Commander of the 1st PSYOP Battalion, based at Fort Bragg, North Carolina, was the designated commander of the PSYOP Task Force in the eventuality of any Panama contingency. He was responsible for developing detailed contingency PSYOP plans, annexes, and products, and for coordinating all PSYOP relevant details with U.S. Southern Command and XVIII Airborne Corps. Prior to the actual operation, often during routing trips to Panama, the commander and other members of his command visited many of the principal target locations and identified potential production facilities - a precaution against late arrival of PSYOP production equipment. Facilitating this planning process was the fact that successive 1st PSYOP Battalion commanders served as Commander in Charge South's senior theater PSYOP officer; knew most key players on the staffs and had a small liaison Cell located in the US SOUTHCOM. Furthermore, once the XVIII Airborne Corps commander (General Stiner) was designated Commander of the Joint Task Force for the contingency, coordination between the battalion and that headquarters (including one- on-one meetings with General Stiner) became a frequent affair. General Stiner would later assume overall responsibility for planning and commanding the operation. He took a personal interest in PSYOP, further enhancing their planning, coordination, and execution. PSYOP were an integral part of JUST CAUSE. The loudspeaker teams deployed with conventional units proved effective in reducing resistance and controlling the local populace. Integration of major themes below joint task force level was slow at first, but picked up momentum as programs like money for weapons began impacting directly on tactical units. Securing Ft. Amador, an installation shared by the U.S. and Panamian Defense Forces was difficult. American dependents could not be evacuated in advance of the attack. 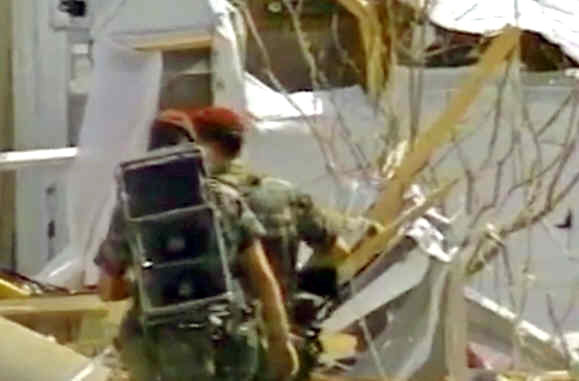 PSYOP loudspeaker teams, from the 1st Battalion, 4th PSYOP Group, were a key asset. When initial appeals failed to persuade the PDF to surrender, the commander modified the broadcasts. The holdouts were warned that resistance was hopeless in the face of overwhelming firepower and a series of demonstrations took place, escalating from small arms to 105mm howitzer rounds. Subsequent broadcasts convinced the PDF to give up. This safe conduct pass is for use by the Dignity Battalions and Codepadi. 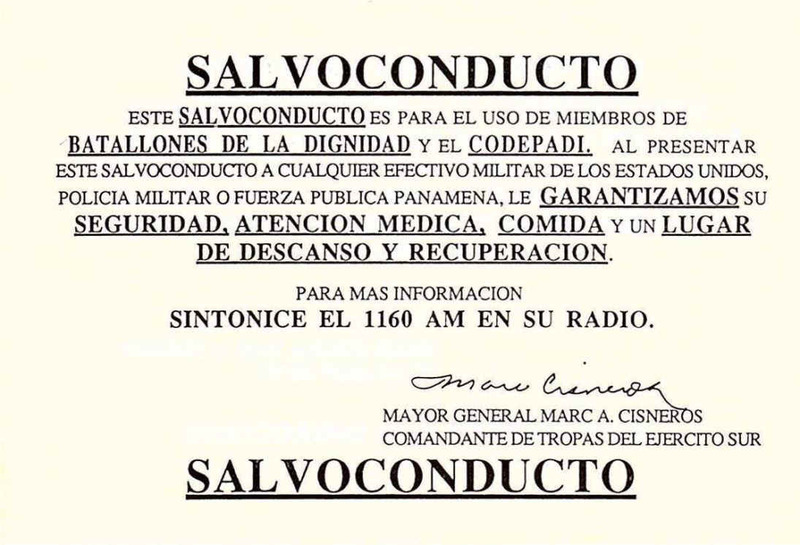 The bearer of this pass, upon presenting it to any U.S. Military member or Public Panamanian force, will be guaranteed protection, medical attention, food, and shelter. For more information tune into 1160 AM on your radio. (Signed) Major General Marc A. Cisneros, Commanding General, U.S. Army South. The Cisneros safe conduct pass was printed on cheap newsprint paper. The 1st PSYOP Battalion quickly printed 300,000 of them. US helicopter crews could carry 30,000 of them on a mission due to their small size. They were dropped on both specified locations and targets of opportunity. $25.00 for Information on Munitions. $25.00 for Grenades. 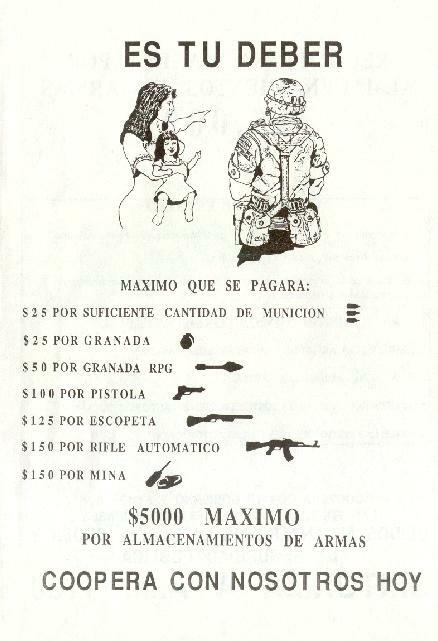 $50.00 for RPG Grenades. $100.00 for Pistols. $125.00 for Rifles. $150.00 for Automatic Rifles. $150.00 for Mines. A maximum of $5000 will be paid for the above weapons. Cooperate with us today. The back is all text. 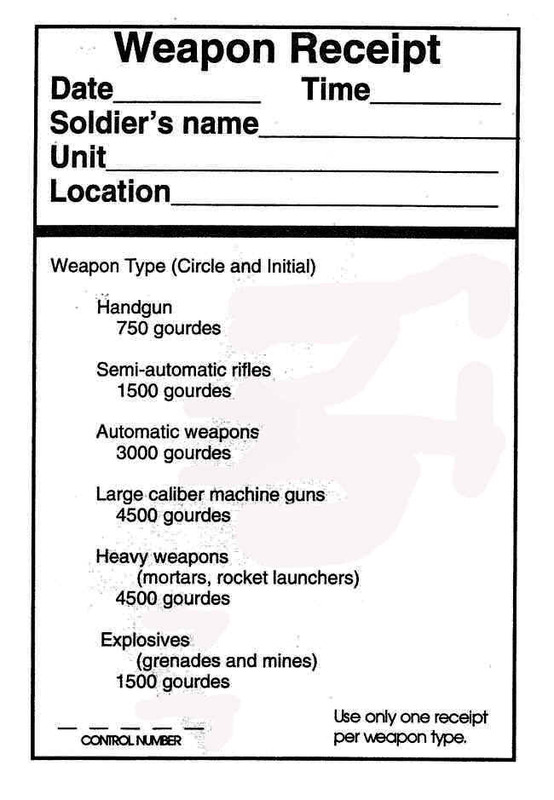 Maximum payment for warehousing of weapons - $5000. PLACES FOR DELIVERY. Police Department near the back of Albrook fountain. National Gymnasium (front of Ancon Inn). Arms will be accepted only at these places daily from 7am to 5pm. DELIVERY PROCEDURES. 1. Remove the loader and ammunition from the weapon. 2. Attach a white cloth to the weapon. 3. Approach with weapon held high by its barrel. 4. Follow the instructions given by the authorities. Cooperate with your Government and help the American armed forces. United we will have law, order and public security. The weapons buy back went very well. One Panamanian civilian actually turned in an armored vehicle. He was paid the top amount for weapon: $150, and seemed pleased enough. No one asked him how he had such an outsized piece of military equipment. There are two creatures in the background that look a lot like Toucans. Tim told me that when they were testing the cartoons they found that the Panamanian people really liked the two birds and thought they were funny. So, Tim decided to leave them in his drawings. He named them Libel and Slander, as a tribute to their unique origin. 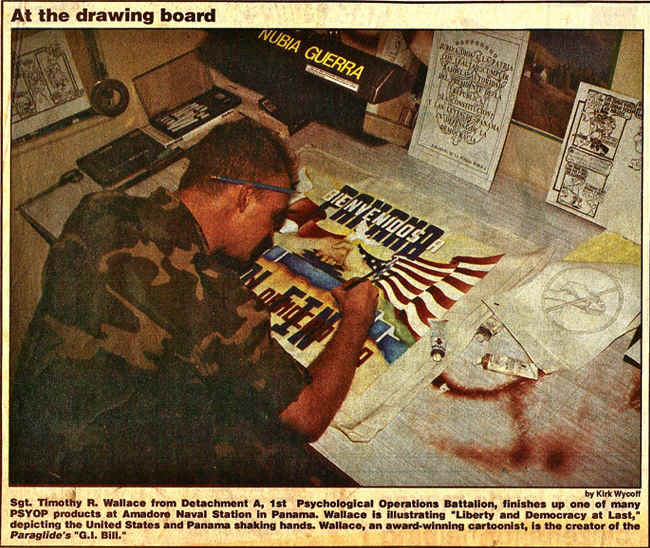 I was an Army illustrator assigned to 1st Psychological Operation BN from 1987-1991. One of my favorite personal stories during my time in 1st POB happened almost 30 years ago during Operation Just Cause. 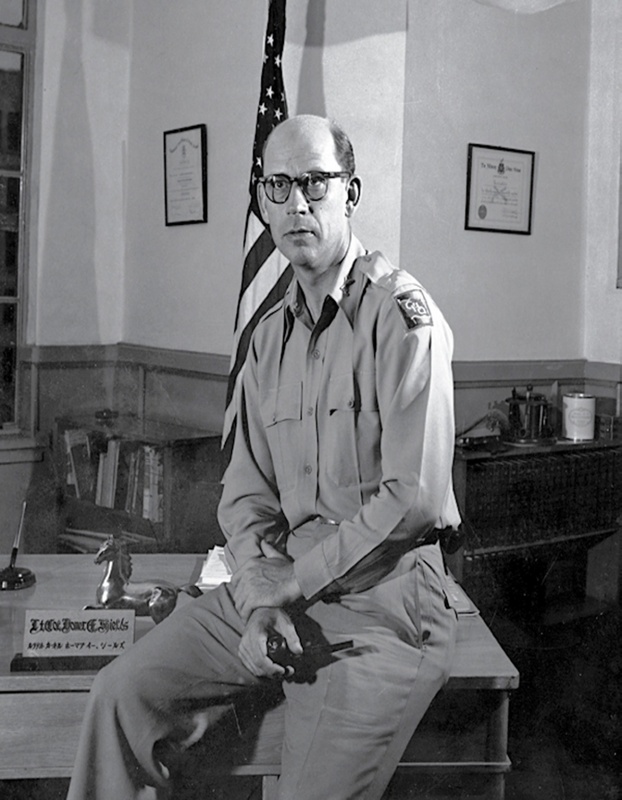 It was during the initial days of the invasion that I was called to the Battalion Commanders office. He along with the S2 (Intelligence) informed me that they would like me to create a series of art work/cartoons that would be deemed black propaganda, i.e. no known source. 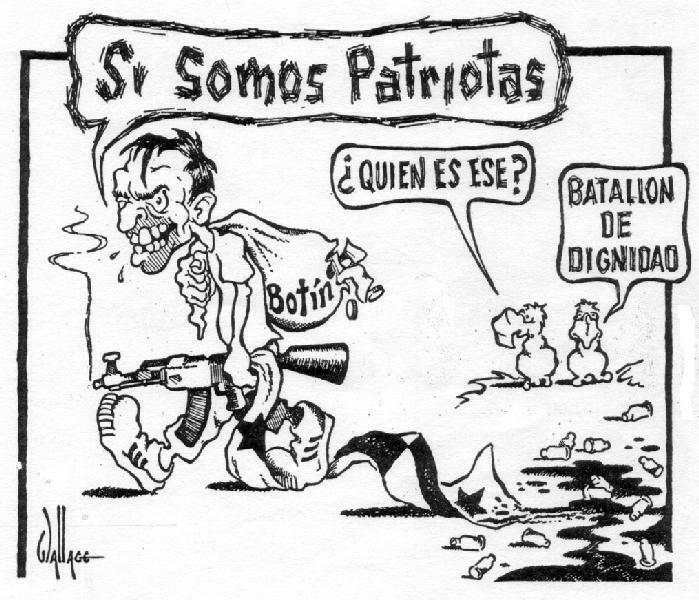 I had a few questions first, but before I could voice them they said that I would be drawing political cartoons of Noriega to be published in the Panamanian newspapers. I was ecstatic! I just had to adopt a pen name to sign the work with to avoid any suspicion of the source. Before my enlistment I had put myself through college as a political cartoonist. While in the army I had used my past experience to establish myself as one of the Armys top cartoonists with a weekly cartoon strip called G.I. Bill which ran in Ft. Braggs post newspaper The Paraglide. two more bubble captions to throw even more barbed insults at Noriega. but they seemed to be more interested in the two birds. Yes, Noriega is a jerk, but they wanted more of the two wisecracking birds. The cartoons were published in the Panamanian newspapers over the next several weeks, and I heard nothing more about it after that. Eventually, U.S. authorities captured Noriega, the invasion was over, and I was sent back home a few months later with the rest of 1st POB. It was not long after I returned to Bragg that I started thinking about those two wise-cracking birds again. I began to wonder how these two birds would do with an American audience. So I began to include them in my weekly G.I. Bill cartoon strip in the Paraglide. They turned out to be a big hit with the soldiers on the post. Later that year, G.I. 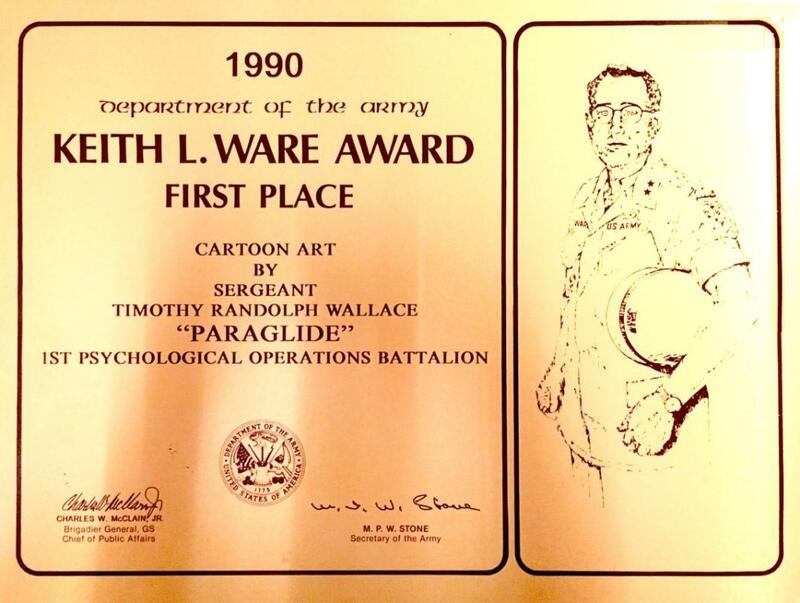 Bill, and the two birds from Panama, went on to win the Armys highest award for military journalism, the Keith L. Ware Award, for best cartoon strip in the Army for 1990. No one was ever the wiser of the black propaganda origins of the two birds, and 30 years ago I made sure I kept it that way. Tactical PSYOP proved to be instrumental in minimizing casualties on both sides. 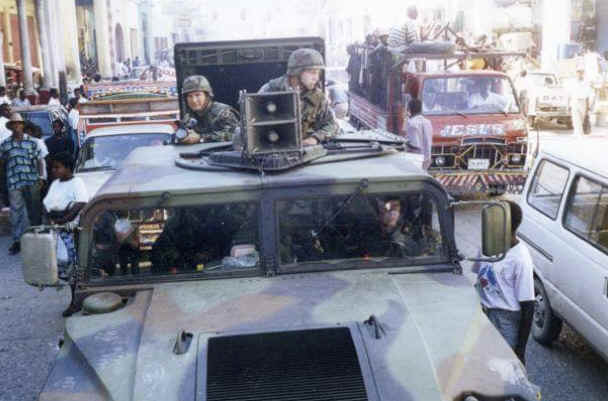 Loudspeaker messages encouraged Panamanian Defense Forces to refrain from resisting U.S. forces, which were there primarily to remove Noriega. 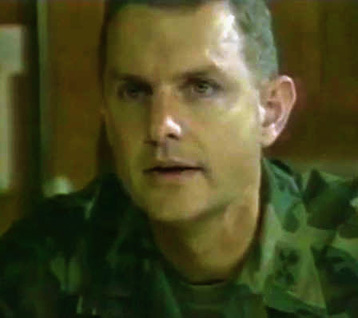 During the spring of 1988, the Commander for the 1st Psychological Operations Battalion, the battalion with area responsibility for Panama, was designated Commander of the PSYOP Task Force in the event hostilities should arise. They didn't have to wait long. On 20 December 1989, Operation Just Cause was executed. The loudspeaker detachment in country fielded 5 loudspeaker teams, which linked up with their designated supported units. Other loudspeaker teams would deploy with their supported combat units (82nd Airborne Division, 1/75th Rangers, US Marines, Navy SEALs, etc). By January 8, 1990, the PSYOP Task Force had produced and disseminated over one million leaflets and handbills, 50,000 posters, 550,000 newspapers, and 125,000 units of other miscellaneous printed materials. In addition to the Volant Solo television broadcasts, the PSYOP radio stations operated 24 hours a day in an effort to get the word out to the people of Panama. The 1st Battalion of the 4th PSYOP Group provided loudspeaker teams to maneuver battalions during D-Day operations; its mission was to assist maneuver units in convincing the Panamanian Defense Force (PDF) elements to surrender by announcing the conditions of surrender after a show of force by the maneuver unit. Its efforts to convince the PDF to surrender saved American and Panamanian lives. Additionally, PSYOP elements were critical during stability operations by assisting in refugee control, disseminating information, and participating in programs such as money for weapons. 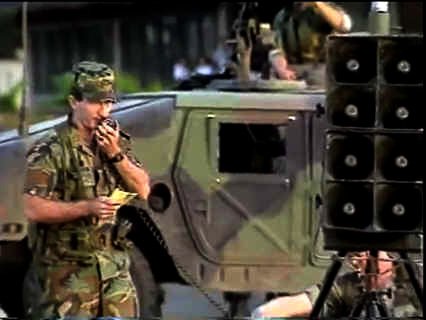 Bored to death by routine guard duty, PSYOP soldiers find the attraction of broadcasting unauthorized messages over the loudspeakers irresistible. During the 8 months in 1988-1989 in which I served on a loudspeaker team in Panama, unauthorized messages were not uncommon. In the summer of 1988, two of us were providing loudspeaker support to a Marine unit guarding fuel supplies at the Arraijan Tank Farm, located on the Pacific side of Panama. My teammate got the bright idea to shout Chestys a leg over the microphone, almost precipitating a small war with the Marines. 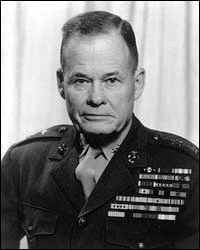 Now for you civilians, Chesty Puller is a legendary Marine hero and a leg is an insult used by airborne troops to demean the infantry that walks to battle. Them are fightin words! Another time we were bored and one PSYOP soldier broadcast Whats the word? over the 450-watt loudspeaker system. To our astonishment a distant Marine yelled the correct response: Thunderbird. This was directly from an ad for Thunderbird, a cheap whiskey you drank when you were broke. On 16 March 1990, the unit was reorganized and redesignated as Headquarters and Headquarters Company, 1st Psychological Operations Battalion. It took part in several deployments to Haiti in 1991 and 1992, 1994, and 2004. It was a beautiful Saturday night, probably late summer of 1994. Wed moved from the ratty old barracks to the spiffier, newer apartment style units next to 20th Engineers. There was one problem: the engineers held PT and other formations right outside our windows. Their activities seemed to center around the sort of fancy podium you might expect engineers to make. So, we were sitting around the barracks drinking. And by we I mean super troopers from A Company and B Company. We decided we would show those inconsiderate engineers. We were just a tiny bit drunk, and not happy with the engineers, so we snuck down well after dark and disassembled their fancy podium. Having disassembled the fancy podium, we realized we had to do something with all the pieces. The engineers made it out of heavy plywood and 4x4s, so it wasnt exactly lightweight. There were 5 or 6 of us all told and we grabbed all the bits and pieces and shuffled off to the woods to dump the components. Then there was the piece de resistance. Gracing the front of the fancy podium was a nifty placard with the engineers insignia and slogan and whatever other honors theyd bestowed upon themselves. It was about the right size for a table. We put it on concrete blocks in the common area and played cards on that thing until I was discharged. It even survived inspections. If the Sergeant Major came around we just flipped the top over. Voila. First with the Finest! The second leaflet depicts a radio at the far right with the frequency of the American-sponsored government station, a map of Haiti and the flags of the United States and Haiti at the left. 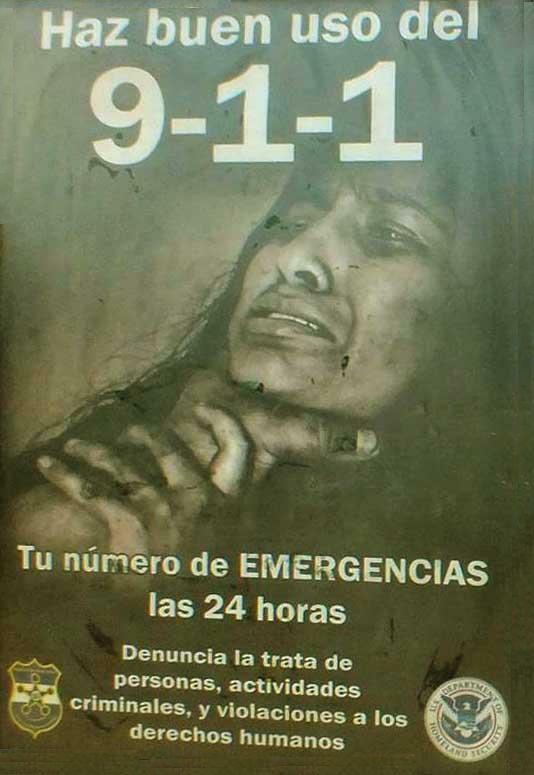 This leaflet was dropped along with portable radios on 15 September 1994. Help us to help you. Listen to Radio 1080 AM 24 hours a day. The American Army has arrived to re-establish democracy. For your own and your family's safety, follow the advice below: Remain calm. Stay indoors. Keep away from windows. Do not form in groups on the street. Leave the American Army alone to work. Do not block traffic. Listen to the radio on 1080 for information. For more information tune your radio to 1080 AM. The 1st PSYOP Battalion has been involved in three major deployments revolving around events in Haiti. 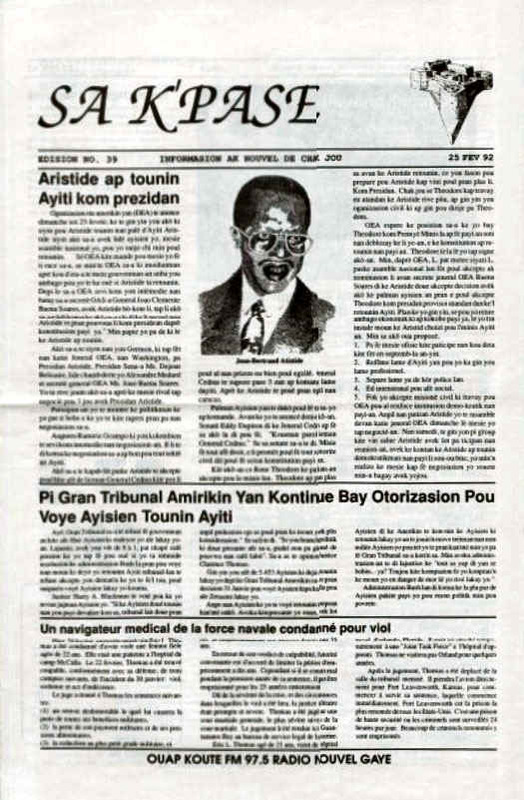 The refugee exodus of 1991-92 following the September 1991 coup d�tat that drove President Jean-Bertrand Aristide from power; Operation UPHOLD DEMOCRACY that restored Aristide to power and laid the groundwork for the 1995 United Nations (UN) mission that was supported by a Haiti Military Information Support Team; and support to the Multinational Interim Force Haiti Operation in 2004, to restore order to Haiti following Aristides resignation and exile. The Peacekeeping operations that we conducted in Haiti during which PSOYPS TPTs were used effectively, included the following tasks: 1) Conduct civil-disturbance operations; 2) Conduct Cordon and Search operations; 3) Construct and Man a Checkpoint; 4) Conduct Vehicular and Personnel Searches; 5) Conduct Civil Affairs operations; 6) Conduct non-combatant evacuation operations; 7) Gather Intelligence; and 8) Conduct Humanitarian Relief Operations. It was very important to involve PSYOP teams and products at these turn-in sites. Many Haitians feared what would happen to them if they turned in a weapon. There was also the fear of getting robbed once you left the site. 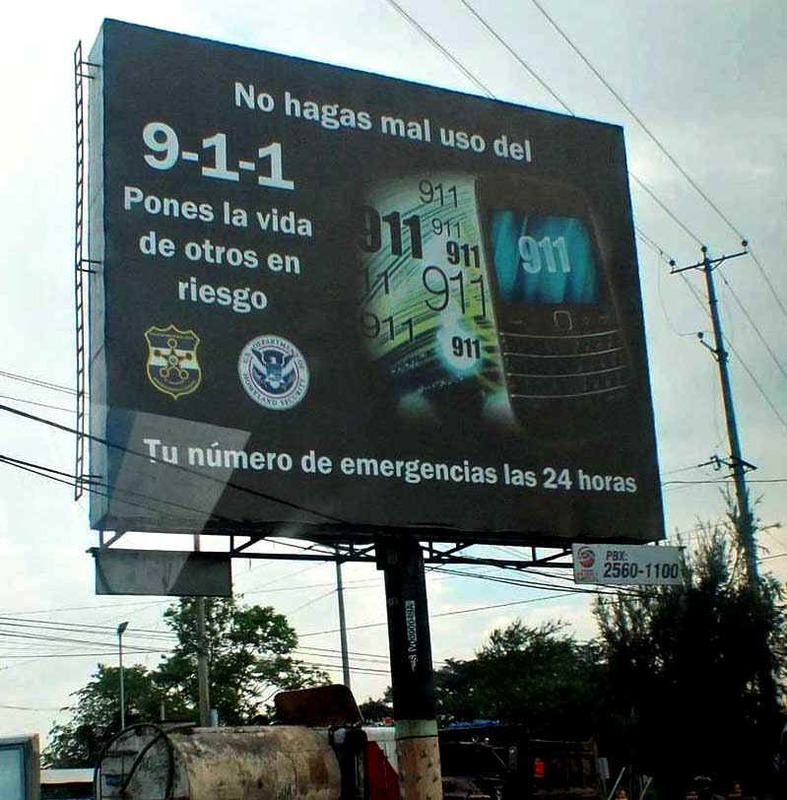 Tactical PSYOP products like pre-recorded messages broadcast in the local community and at the turn in site, along with signs, could help temper these fears. Troops patrolling the area around the weapons buy back site helped reinforce the secure environment that we had created. PSYOP support to Operation SEA SIGNAL began with the initial planning in late January and early February of 1994. Migrant operations were originally established on the US hospital ship COMFORT in Kingston Harbor, Jamaica. Because of a greater influx of Haitian migrants than was expected, the operation was transferred to the Guantanamo Bay Naval Base, Cuba. The PSYOP Support Element (PSE), consisting of the JTF-160 J3 PSYOP Staff Officer and a Military Information Support Team (MIST), deployed to Guantanamo on 14 July, 1994. The MIST supported Joint Task Group McCalla for the Haitian humanitarian assistance mission through multimedia resources. Every effort was made to provide as much information to the Haitians as possible. The MIST produced a Creole language newspaper, SA K'PASE, which presented a balance of news articles on both the positive and negative situation in Haiti. The Psychological Operations Airmobile Dissemination System (PAMDIS) provided a radio station on which news, entertainment, and other broadcasts were presented in Creole over 97.5 FM, "Radio Creole." Analyses the supported units mission and develops a PSYOP mission. Plans and conducts peacetime military information support operations in support of the host nation. Develops an information campaign plan. Collects information and conducts target analyses. Develops products from selected themes and symbols (print audio and video). Conducts pretesting and obtains product approval. Disseminates products and conducts post-testing. Deploys from the Continental United States into theater providing the primary MIST training vehicle to develop, coordinate, integrate and execute implied and specified battalion, theater and country team goals and objectives. The United States Special Operations Forces Posture Statement 1993 discusses a little about what the PSYOP element did there. PSYOP personnel used their equipment and interpersonal communications skills to provide current information to the camp populations, to neutralize misinformation and rumors, to enhance law and order within the camps, and to create a more positive atmosphere. Fliers, posters, instructional wallet-sized cards, maps to relief centers and a newsletter were crafted by teams working around the clock. On 16 November 1995 the Battalion was once again reorganized and redesignated as Headquarters, Headquarters and Service Company, 1st Psychological Operations Battalion (with organic elements concurrently constituted and activated with personnel from provisional units). This is the start of the Battalions serious commitment to Southern Command (SOUTHCOM) operations. The 1st Battalion has provided support to mine clearing efforts in Peru and Ecuador for several years following their 1995 border war. Mine clearing missions throughout the mid 1990s also included Honduras, Nicaragua, and Guatemala. Coordination for these missions was conducted by the Inter-American Demining Board, a humanitarian organization formed to eradicate residual anti-personnel and anti-equipment mines from past conflicts throughout Latin America. 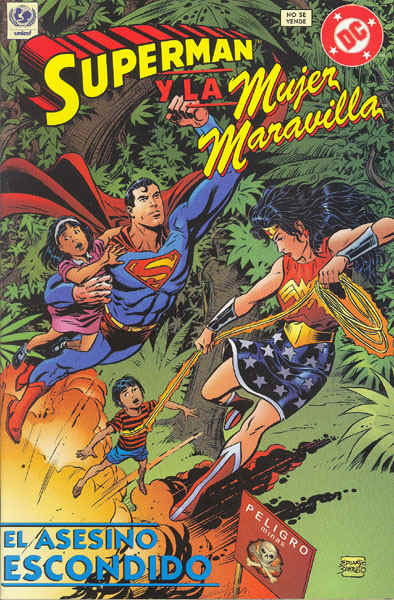 My files add that the comic book in Spanish was released for children in Latin America 11 June 1998 at UNICEF House at UN headquarters in New York City. Brian Sheridan, principal deputy to the assistant secretary of defense for special operations and low-intensity conflict, represented the Defense Department at the unveiling ceremony. He called the book a major step forward in the effort to protect children in Costa Rica, Nicaragua, and Honduras from the threat posed by land mines. The book is 32 pages long, and includes 24 pages of story and eight pages of activities targeting children between 8 and 15. Soldiers from the 1st PSYOP Battalion conducted assessments in Costa Rica, Nicaragua, and Honduras, provided background information and photos and recommended a story line to the creative staff at DC Comics. The collaboration ensured accuracy and that Central American children would be able to identify with the villages, countryside and clothing depicted in the new book. 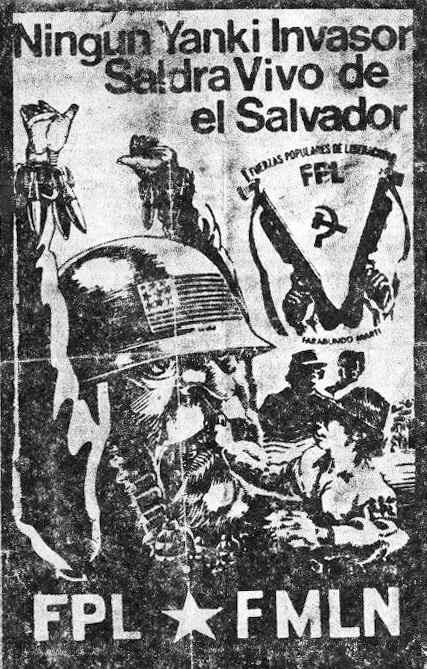 Once the story and artwork were completed, the battalion tested the comic book in Central America to see if it conveyed the intended message. Members of the Armys Special Forces, as well as the staffs of UNICEF, U.S. embassies and local governments, worked together to distribute the book throughout the region. The comic books were distributed through U.S. embassies, and presented to the Ministries of Education in Honduras, Nicaragua and Costa Rica. A U.S. Southern Command Mine Awareness Team assisted the host ministries of education in the distribution. 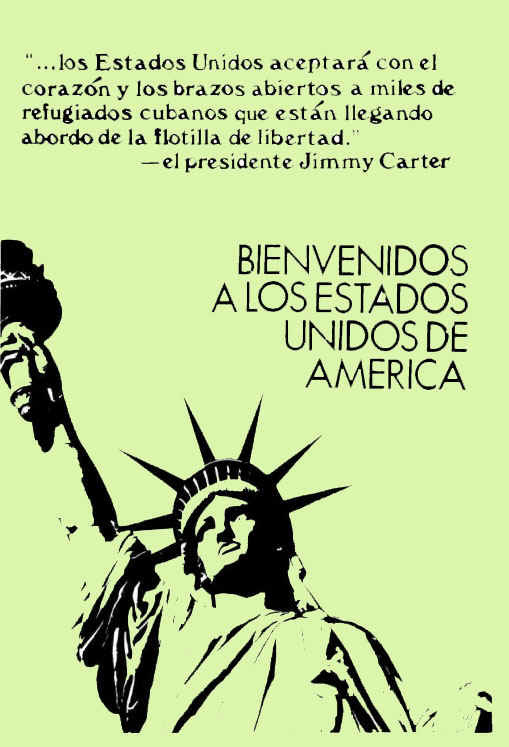 The initial printing was 650,000 copies of the book, 560,000 in Spanish and 90,000 in English. 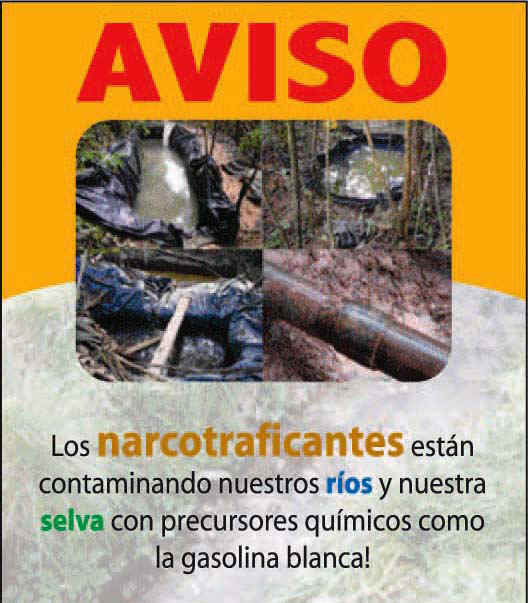 Mine-awareness posters based on the comic book, 170,000 in Spanish and 30,000 in English, were distributed in Latin America. MISTs supported mine clearing programs, but often the 1st POB provided specialized teams that focused only on mine clearing while MISTs continued counter-drug activities. These mine clearing missions drew national attention, allowing the 1st POB the opportunity to work with DC Comics in the production of two Superman Comic books depicting the dangers of un-exploded mines to local children. 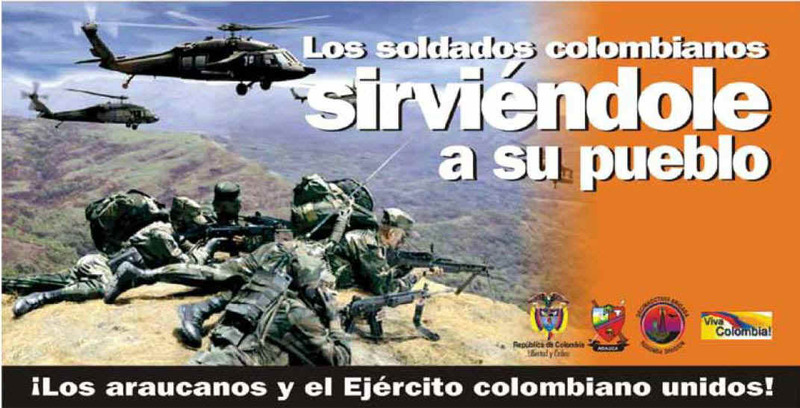 The indigenous people and the Colombian Army united! The 1st POB supported professional development of Latin American militaries and operability with US forces through a series of Field training and Command exercises based on the "Panther" simulation that focused on Low Intensity Conflict (LIC) and the employment of military forces in LIC situations. Exercises were sponsored by the Southern Command as part of Fuerzas Unidas (United Forces), and took place in successive years in various South and Latin American countries. The 1st POB personnel, including civilian analysts, participated in Fuerzas Unidas war games in Peru, Ecuador, Colombia, Paraguay, Honduras, and El Salvador. Until recently much of 1st BNs activities have focused on counter drug operations, humanitarian assistance and de-mining. In January 2003 that mission began to change due to the strengthening and reemergence of several groups classified as terrorists by the National Security Council such as FARC, ELN, ELN-Bolivia, Sendero Luminoso and AUC. 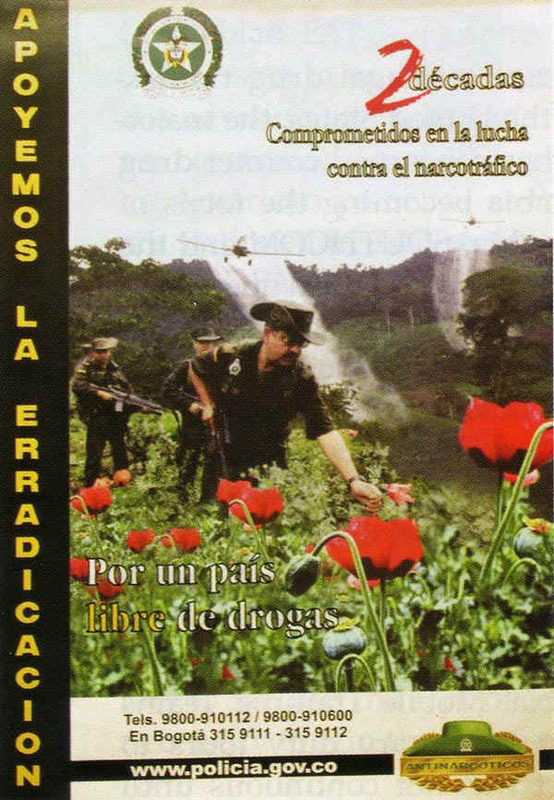 The First PSYOP Battalion was tasked with converting their primary mission of Counter Narcotics (CN) to one of Counter-Narco Terrorism (CNT) and to some extent, stabilizing elected governments. This change of mission met with many resounding successes in countries such as Colombia, Ecuador, Paraguay, and Bolivia. When Secretary of Defense Donald Rumsfeld deemed Guantanamo Bay, Cuba the Least Worst Place to establish a US Detention Facility in support of Operation Enduring Freedom in Afghanistan in December 2001, the 1st POB began its first mission in support of Global War on Terror. In early January 2002 a two man team from Alpha Company deployed as a PSYOP Assessment Team in support of JTF-160 & later supporting JTF-170 as well. The primary mission of the psychological detachment in Guantanamo Bay was to provide PSYOP support to facilitate cooperation amongst detainees for security purposes as well as intelligence gathering. During this time, the 1st Battalion participated in the interrogation of several hundred suspected terrorists and detainees to provide usable intelligence for the National Security Council and other security agencies. The detachment was also able to conduct pre-testing of PSYOP texts in direct support of the 8th POB and their efforts in Afghanistan and Pacific Command Efforts in the Philippines. At the left and right of the leaflet, we can just make out the fearful face of snarling Jinn. The Koran identifies the jinn as creatures created from a smokeless fire. They lie and practice deceit to fulfill their own desire for evil. 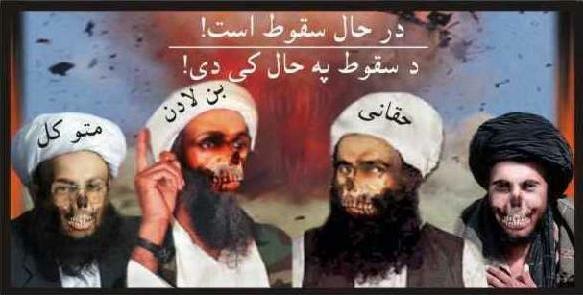 Showing them with the Taliban implies that the leaders have been deceived and turned toward evil by the supernatural creatures. As Operation Iraqi Freedom was gearing up in January 2003, the 8th PSYOP Battalion was forced to split its efforts between the war in Afghanistan and the toppling of the Saddam Hussein Regime in Iraq. In order to allow the 8th POB to focus their efforts on Iraq, the 1st POB intervened and functioned as the rear Product Development Detachment (PDD) for the and provided reach-back capabilities for ongoing PSYOP missions in support of Operation Enduring Freedom in Afghanistan. These duties included the following: developing print, radio, audio-visual and novelty item products derived from the Target Audience Analysis Worksheets sent from the Afghan theater. Products were received in English; translated into target language (Urdu, Pashtu etc. ); edited; vetted through the appropriate analysts and pre-tested in preparation for their use in Afghanistan. 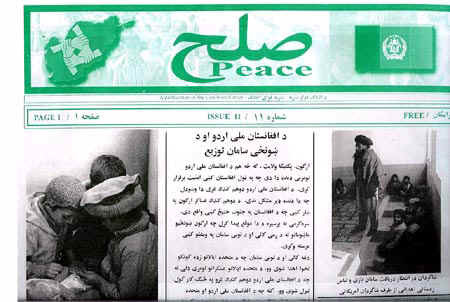 The 1st PSYOP Battalion also provided direct support in the form of articles and editorials for the Peace newspaper currently being disseminated in Afghanistan.This bi-weekly, full-color publication was published in three languages (English, Pashtu, and Dari) and had a distribution of over 110,000 copies. Disseminated by U.S. and Afghan forces, it gave international, national, and regional news to the local populace, emphasizing the US-Afghan partnership in rebuilding the country. 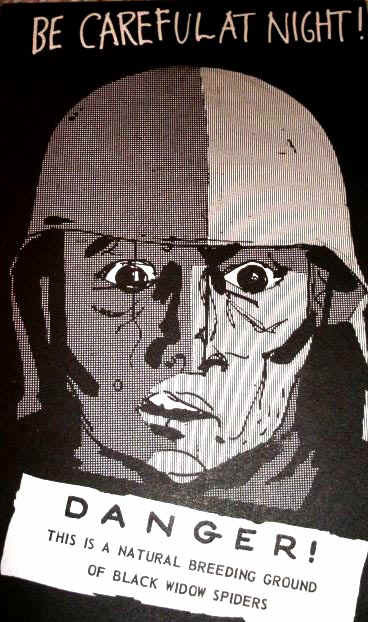 The one-page comic insert, Captain Pahlawan, later became a full-fledged comic book for CJTF-76. 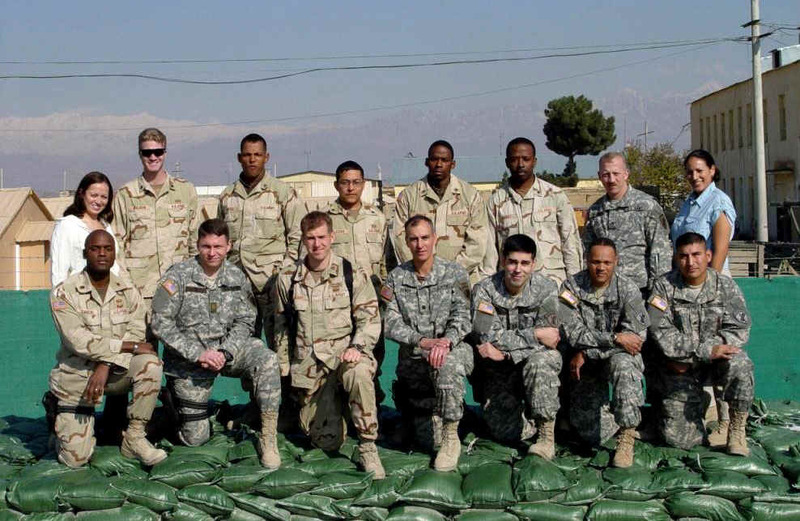 In the summer of 2005, after nearly three years of supporting both Afghanistan and Iraq, the 8th Psychological Operations Battalion was refocused solely on Operation Iraqi Freedom. In September 2005, the 1st PSYOP Battalion (-) deployed in support of Operations Enduring Freedom, its first operation outside of the Southern Command area of Operation Desert Shield/Desert Storm in 1990. Over 30 Soldiers took up major positions in Bagram Air Field and the United States Embassy in Kabul. The Battalion HQ (-) became the PSYOP Task Force - Afghanistan Headquarters in support of Combined Joint Task Force 76, the primary ground combat unit in Afghanistan and eventually took command and control responsibilities for all PSYOP forces in country. A reinforced PSYOP Support Element became the Product Development Center on Camp Vance. Finally, an eight man Military Information Support Team (MIST) conducted operations in Kabul in support of Combined Forces Command  Afghanistan and the US Embassy Kabul. The Psychological Operations Task Force- was the nerve center of psychological operations in Afghanistan. It quickly became a crucial member of the CJTF-76 battle staff. Additionally, the task force developed and implemented the Border Region PSYOP plan. 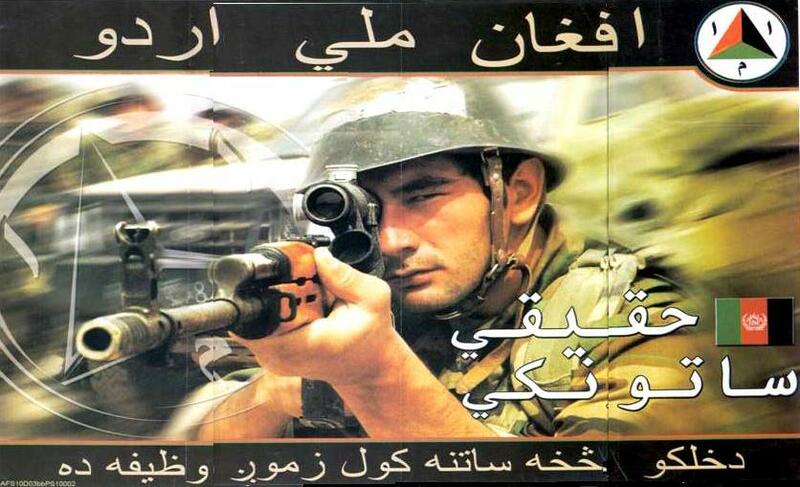 This multi-level campaign used radio, television, and newspaper to influence the populations in sixteen provinces along the Afghan  Pakistani border. 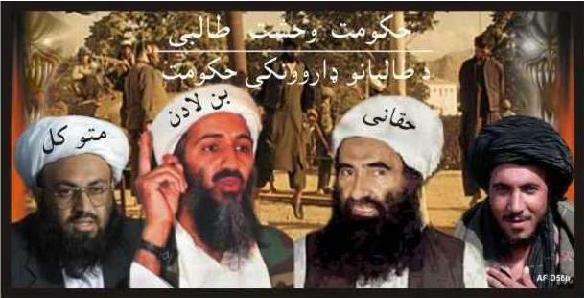 Their message was to convince the population to resist incursions from the Taliban and other Anti-Coalition Militias. The task force also contributed to the intelligence effort and was active with the Bagram Detention Facility, interviewing over 50 detainees for PSYOP-relevant information. This information helped to revise Target Audience Analyses allowing the Product Development Center to develop focused and effective products for their area of operation. The Military Information Support Team (MIST) also began operations in September 2005. The MIST developed a strong support relationship with the Afghan National Army and the Afghan National Police. When the MIST passed to the 5th PSYOP Battalion in April 2006, over 1200 former militiamen had turned in their arms and agreed to become peaceful members of society. The MIST support to the ANA and ANP were equally important. 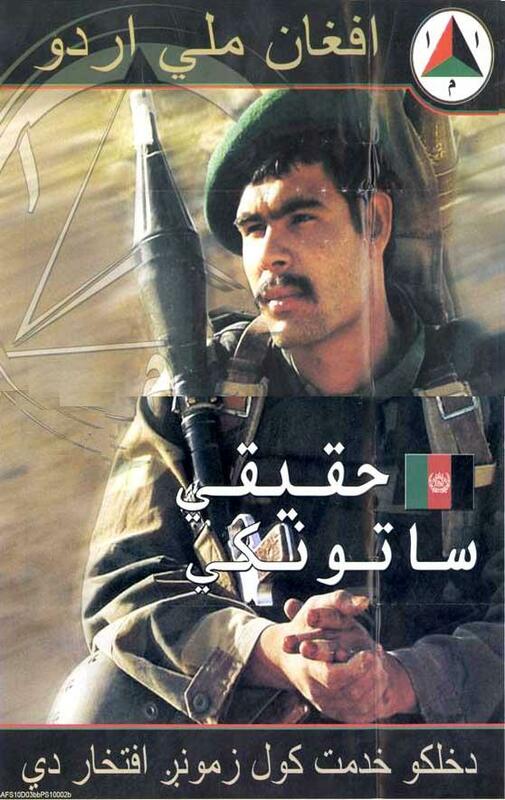 The Afghan National Army had become one of the strongest and most capable components of the Afghan government, and the MIST ensured that the country was aware of it. The Product Development Center consisted of 14 Soldiers who wrote, developed, and distributed nearly 80% of the PSYOP products in Afghanistan produced between October 2005 and April 2006. It became the primary source for print and radio production for US forces in the country, producing over 1500 approved radio, video, and print products in support of CJTF-76 and its subordinate commands. This leaflet had four cartoons in full color. The first shows an American aircraft dropping humanitarian daily rations (HDR) food packets. 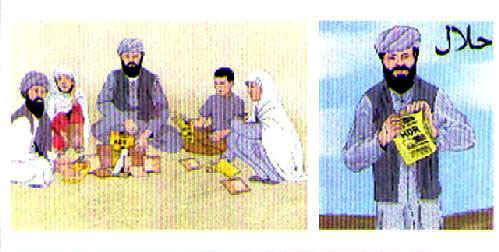 The second shows an Afghan picking up one of the packets. When turned over, the leaflet shows the Afghan tearing open the packet. The word "Halal" is at the upper right. This term shows that the food was prepared in accordance with the Koran. The final illustration shows the Afghan sitting with his entire family and enjoying the feast sent by the Americans. The leaflet is clearly designed for illiterate Afghans and shows them what to do with the yellow packets found on the ground. The literacy level along the border areas was among the lowest in the country, which required a print product that could convey the message with a minimum number of words. The PDC developed a number of regionally specific handbills, posters, and leaflets that were effective with each specific population, disseminating more than 8 million print products throughout the country. In April 2006, the 315th Tactical PSYOP Company and A Co, 5th PSYOP Battalion, arrived in Afghanistan and relieved the 1st POB. All of the units soldiers returned safely home. As the Southern Commands regionally aligned PSYOP Battalion, the 1st has had a long standing relationship supporting defense cooperation in Latin America, Central America and the Caribbean. In January 2003, their mission changed from mostly Counter-Narcotics to one of Counter-Narco Terrorism and to some extent, stabilizing elected governments. Since 2011, the war on terrorism in South America was waged by Psychological Support Elements. With the return of the 1st Battalion the name was changed to Military Information Support Team, (MIST). The MISTs have been deployed to Colombia, Peru, Ecuador, Paraguay, and Bolivia in support of Global War on Terror. PSYOP Military Information Support Teams (MISTs) were deployed to Barbados, St. Lucia and Grenada to work with local committees to develop drug awareness campaigns; media ranging from bumper stickers to television commercials were used as part of the fight against narco-terrorism. 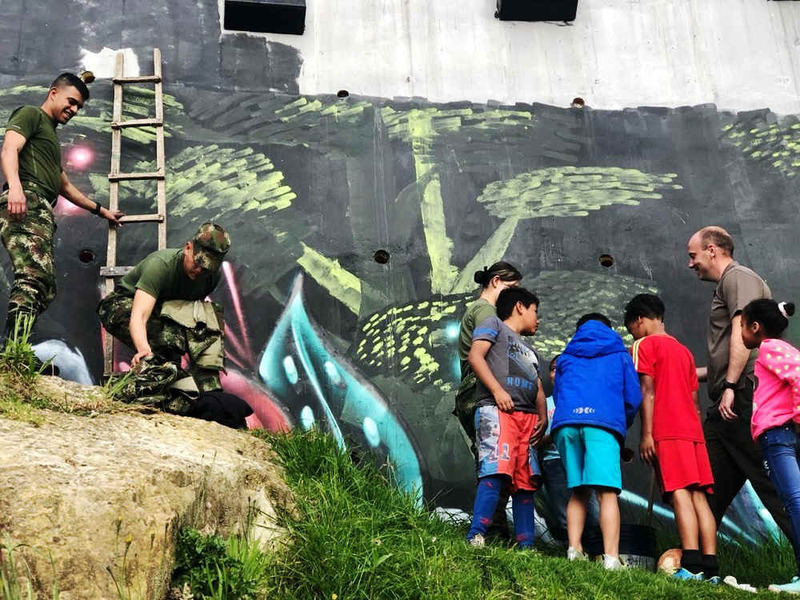 In Bolivia, the Dominican Republic, Guatemala and Jamaica, other MISTs were deployed to work alongside anti-drugs campaigners directed at schoolchildren using coloring books, videos and other media. In Bolivia, they were said to have helped to decrease the numbers of hectares that were used to cultivate coca. 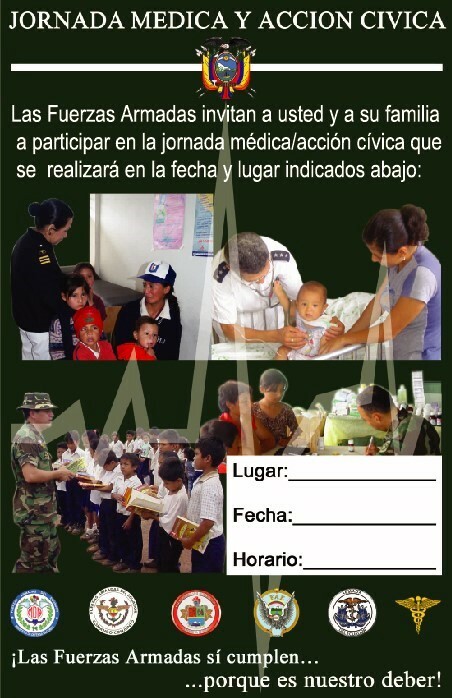 In Belize, cholera prevention materials were supplied, and in Venezuela, PSYOP personnel developed information campaigns supporting "democratization, professionalization of the military, civil-military relations, and counter-drug operations. In more recent years the Battalion has operated in numerous countries of South and Latin America using Military Information Support Teams. The teams produce print products and Radio messages in support of their missions. 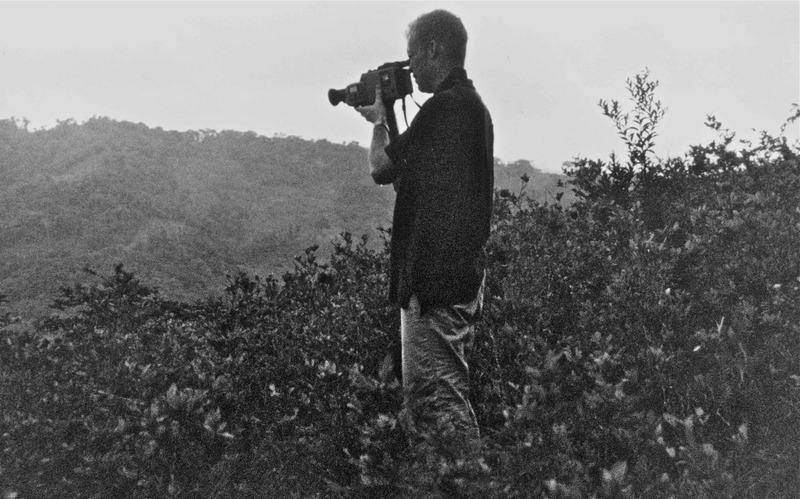 I was sent out to film illegal coca fields to bring back to the unit to be used in future products. I spent most of the trip flying around in a Blackhawk helicopter flown by Bolivian pilots looking for illegal coca crops to film from the air and the ground. Later I found out that someone had snapped our photos while we had lunch with our Bolivian pilots at an airport. They were later published in the local news service in Bolivia where we were described as DEA agents. I heard that the bosses back at Ft. Bragg were not too pleased by that. In August of 2009, The 1st PSYOP Battalion was invited by the Ambassador, U.S. Office of Defense Cooperation Paraguay, to deploy a Military Information Support Team (MIST) to Paraguay. The Team was ordered to Asuncion, Paraguay from 1 October 2009 through 30 September 2010, to conduct the approved Trans-Regional PSYOP Program to support stability operations whose purpose is to eliminate internal threats and deny conditions that could be exploited by terrorists, drug trafficking organizations, and their enablers. The MIST programs were to focus on disrupting conditions that could be exploited by violent extremist activities and their enabling networks. The Special Operations Command South did not have the organic assets to conduct PSYOP planning to support Public Diplomacy so the MIST would align itself with other Department of Defense and inter-agency information operation activities in order to disrupt illegal activities that support transnational narco-terrorism and terrorism operations in Paraguay. These activities would assist and enhance the partner nation in their ability to deter the establishment of illegal institutions. There were currently no active indigenous terrorist organizations in Paraguay. There were no political groups or parties that were currently active in the country that are specifically targeting U.S. interests. However, given the presence of sympathizers and support for extremist terrorist groups in the border Area of Paraguay, Argentina, and Brazil, visitors there could not discount the possibility of terrorist activity, to include random acts of anti-American violence. The general threat in the designated training areas in and around Asuncion is low for domestic terrorism and high for crime. The U.S. Ambassador or his/her designated representative had final product approval and dissemination authority of all PSYOP products intended for dissemination during peacetime activities. Personnel were not authorized to deploy with weapons and deployed with organic equipment minus weapons. 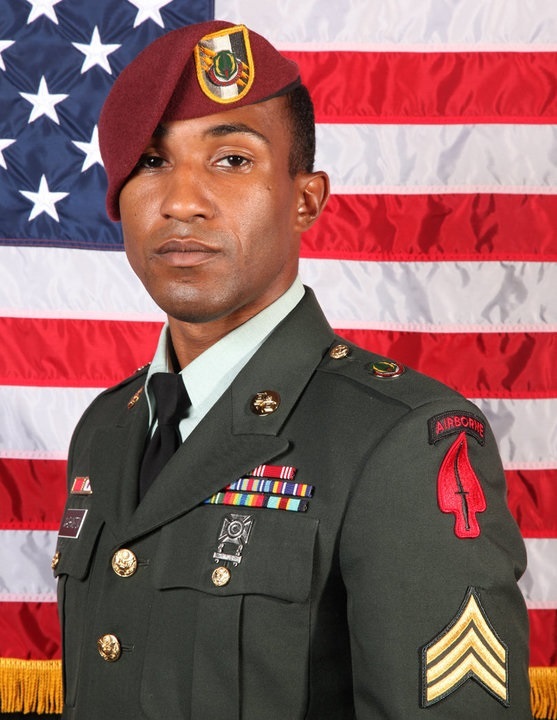 U.S. Army Sergeant Victor Washington of A Company, 1st PSYOP Battalion was deployed to Colombia as part of a MIST (Military Information Support Team) in 2008 and 2009 as a multimedia illustrator. This leaflet below was designed by him. In 2009, the 4th PSYOP Group showed off their unique talents and skills to the Fort Bragg community at their annual Regimental Week open house and technology demonstration. Michelle Butzgy discussed the various PSYOP Battalions in an 11 June Paraglide article entitled: Fort Bragg Soldiers work at winning hearts and minds around the world. She pointed out that at that time the 1st PSYOP Battalions area of operation was the Southern Command or South America. Members of the unit had been deployed to Peru where the team members analyzed information and gave advice to local governments. In 2014, the U.S. Army tried a new solution to the half-century long violence propelled by Colombias insurgent guerrilla group: Soap Operas. The radio soap opera series promoted demobilization, deterred recruitment by the FARC rebel group, as well as tackled cultural issues across the country. The 15-minute long episodes were based on statements from real, demobilized guerrilla fighters. A U.S. MISO team in Colombia implemented the radio novella, which will be divided into two sets of eight episodes and one set of four episodes that will carry out specific objectives. Radio broadcasts have proven to be the most effective means of communication for the MISO team, particularly when their target audience is located in remote areas. In 2017, Colombian officials began paying farmers who voluntarily pull up their coca and enter a two-year program to transition to legal crops. The government will pay families up to $12,000 over a two-year period. Colombian troops in Blackhawk helicopters scattered PSYOP leaflets into the air, each one printed to resemble high-denomination peso bank notes. On the flip side was a cash offer for confidential information leading to drug busts. MIST Bolivia was primarily a Government Stabilization mission but did contribute to depriving terrorists of external funding sources. The team was able to establish several programs that enhanced the public image of the countrys military and police forces. This in turn led to greater cooperation between the government and its citizens and thereby increased reporting of narco-terrorists. The MIST Colombias mission is to decrease the combat effectiveness of narco-terrorist groups by increasing the number of desertions, defections, and surrenders; increasing the public support for the Government of Colombia institutions and policies that combat terrorism, narco-terrorism and the activities that facilitate them; reducing the financial and cover support for terrorist networks and finally maintaining security forces institutional professionalism, productive civil-military relations, and respect for human rights. Also of importance are campaigns against high-value individuals. 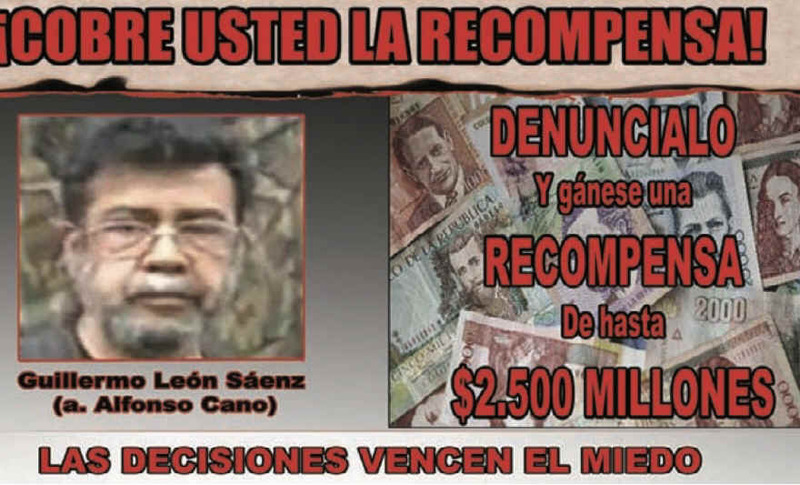 These campaigns have also proven fairly successful, with the killing of the FARCs leader Alfonso Cano in November 2011. Information related to Canos location was derived from citizens who were influenced by the campaign to report. 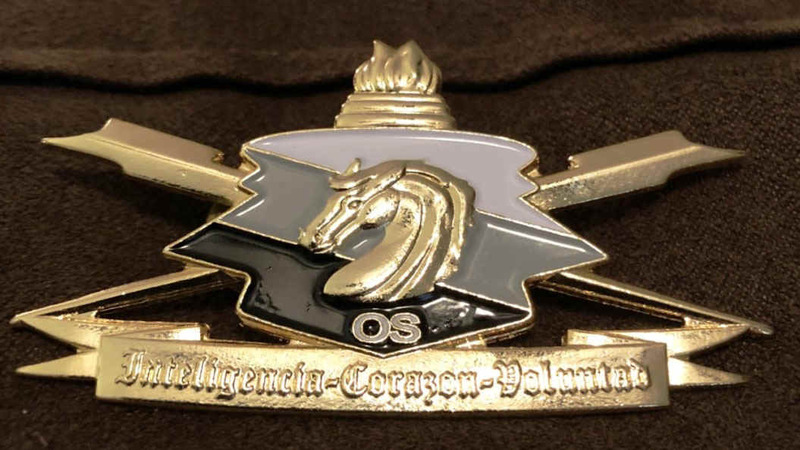 The 4th PSYOP Group adds: MIST Colombia consisted of one officer and eight enlisted personnel based out of Bogota, Colombia and one analyst working from both Bogota and Fort Bragg. A primary focus of the teams mission was to provide PSYOP planning support to the Colombian Military. In addition, the MIST worked closely with Joint Task Force Omega and Task Force South Tolima efforts to pursue and capture or kill top FARC commanders as part of Defense Support to Public Diplomacy. An important component of this effort was to convince FARC insurgents to demobilize and provide operational intelligence for Colombian Military Special Forces planners. In 2011 the MIST exploited the successes of numerous Special Operations Forces missions including the death of FARC Secretariat member Mono Jojoy and numerous FARC Front commanders. In November this effort culminated in the death of the FARCs supreme commander, Alfonso Cano. The MIST also provided support to the Colombian Navy and counter-narcotics police by developing, and disseminating products in support of a program seeking information on the location of Self-Propelled Semi and Fully-Submersibles used to carry cocaine for eventual entry into the United States. This data led to the location of multiple ship-building locations. The MIST coordinated multiple counter-recruitment efforts to reach youth in high conflict areas. 1. Please take care of your children. 2. If you are given a number, please be respectful of your turn and wait to be called. 3. Don't leave the line. We will attend to you as quickly as possible! Thank you for your collaboration. The Military serves...Because it is our duty! The U.S. Army Military Information Support Teams in Ecuador mostly seem to have been involved in the war or drugs. The 1st PSYOP Battalion was responsible for placing anti-drug billboards in many of the major cities in that country in 1970. We depict several below along with where they were placed. 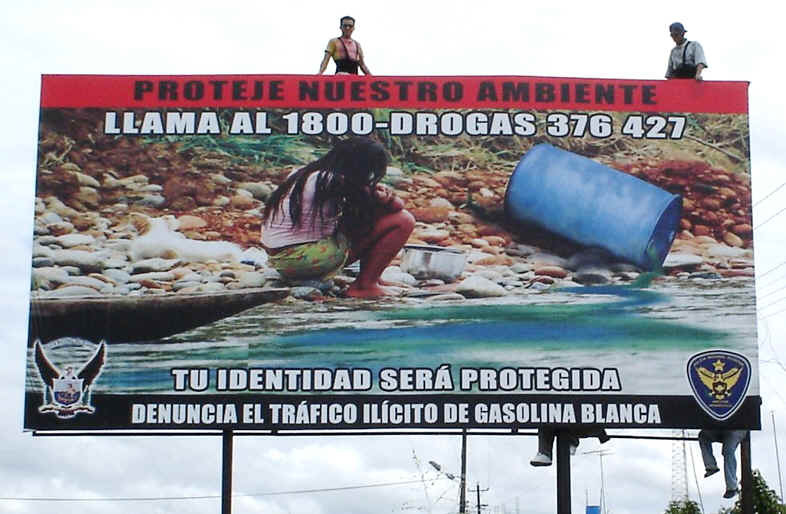 Note that instead of attacking the drugs, the billboards often attack the chemicals used to make those drugs. 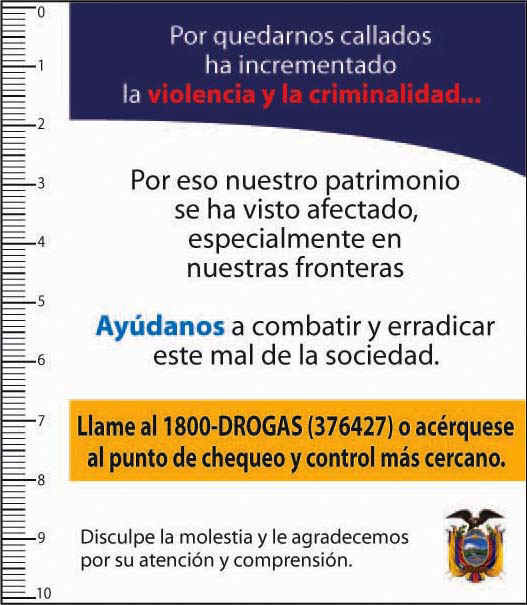 A Laminated anti-drug calling card designed by the 1st Battalion in Ecuador. Remaining silent has increased violence and crime. Help us to fight and eradicate this evil of society. Call 1800 Drugs (376427) or get to the nearest checkpoint for closer control. The secondary objective is to increase the overall effectiveness of checkpoints. How cool it is to live without drugs! Protect our environment. Call the 1800-drugs 376-427. MIST Ecuador missions are to increase public support for the Government of Ecuador institutions and policies that combat terrorism, narco-trafficking, respect for human rights, reduce the ability of terrorist groups to generate revenue, decrease illicit crop cultivation and drug production, to stop the flow of illicit drugs through and out of the region, and to stop illegal arms distribution. According to the U.N. 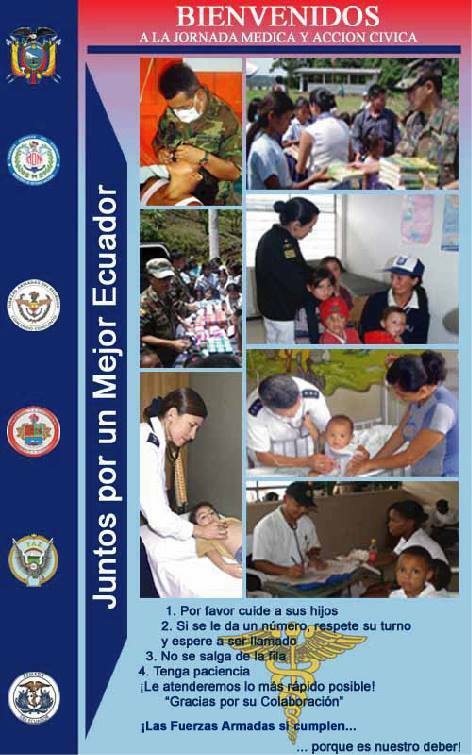 Mine Action Assessment Mission Report on Ecuador, there have been few organized mine awareness campaigns in Ecuador. 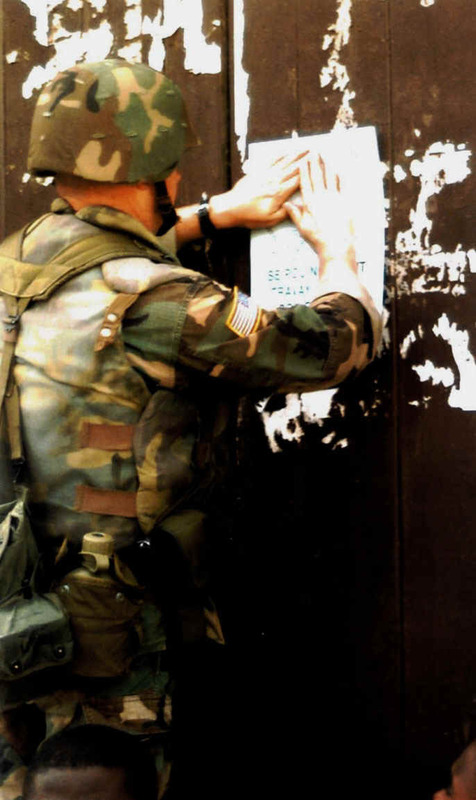 In 1999, the U.S. Military Information Support Team produced and distributed mine awareness posters and folders with prevention messages. The Ministry of Education, National Police and electric companies have recently shown interest and have begun developing mine awareness programs. 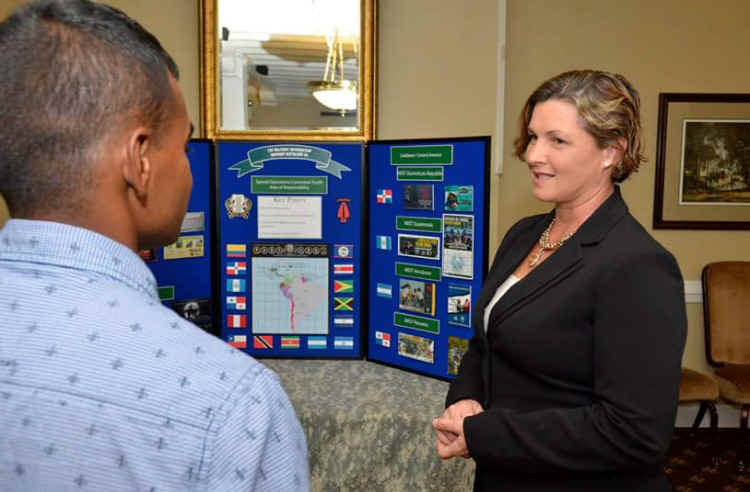 Recognizing that a greater effort is necessary, the OAS is being urged by international donors to take on the main role in creating and implementing a special humanitarian demining program that is crafted especially for this area. Since 1999, U.S. military personnel have trained 612 Ecuadorian Army personnel in basic demining techniques. The 4th PSYOP Group adds: MIST Panama consisted of one officer and three enlisted personnel based in Panama City, Panama, supported by a Cultural Intelligence Cell (CIC) analyst located at Fort Bragg who periodically deployed forward. A primary mission of the team was conducting Foreign Internal Defense activities in support of USSOCOMs Trans-Regional PSYOP Program and US Country Team objectives by working by, with, and through Panama's Air and Naval Service and Border Security Force, providing mission planning support and training on the PSYOP development cycle, and facilitating collaboration between the two security forces. MIST Paraguay was established with the primary focus of the Tri-border Area which encompasses pieces of Paraguay, Brazil, and Argentina. This area has had a large influx of Islamic people during the last decade and is repudiated to be a potential recruiting and training area for Al-Qaeda and other terrorist organizations. MISSION: Upon order, the 1st POB deploys a MIST to Asuncion, Paraguay, from October 1, 2008, through September 30, 2009, to conduct the approved Trans-Regional Psychological Operations (PSYOP) Program to support stability operations, whose purpose is to eliminate internal threats and deny conditions that could be exploited by terrorists through their enablers. PSYOP forces will assist in establishing control over ungoverned and under-governed spaces. PSYOP programs will focus on disrupting conditions that are exploited by terrorists through a Counter Narco-Terrorism nexus. As improving governance and supporting institution building are inexorably linked, PSYOP programs must supplement and augment other ongoing Civil Military Operations and like efforts to deny conditions that could be exploited by terrorists and their enablers. Total personnel deployed: Not to exceed six personnel. Routine rotation of forces is authorized. Focus activities will achieve two objectives: support stability operations by conducting activities that legitimizes partner nation governments, militaries, and police forces; and focus activities on the nodes and centers of gravity that will meet Global War on Terrorism objectives. There are no indigenous terrorist organizations in Paraguay. There are no political groups or parties that are currently active in this country that are specifically targeting U.S. interests. However, given the presence of sympathizers and support for extremist terrorist groups in the Tri-Border Area of Paraguay, Argentina, and Brazil, visitors here cannot discount the possibility of terrorist activity, to include random acts of anti-American violence. In the spring of 1988, a team of Peruvian military officers arrived at Fort Bragg, North Carolina, having been tasked with developing a strategic propaganda campaign directed at countering the influence of the Sendero Luminoso. Officers from the Peruvian Armed Forces teamed with US forces to conduct target analysis and campaign development. From 1 May to 3 June 1988, this joint Task Force Inti shared their experiences and perspectives to hammer out useful propaganda. Safety for family, personal safety, and economic circumstances were identified as the most easily exploitable vulnerabilities. Other vulnerabilities were deemed to be only moderately susceptible to exploitation: lack of resources; religious orientation; and response to authorities. MIST Peru transitioned from a counter-drug to a counter narco-terrorist mission. The efforts were centered in the northern border area because FARC rebels crossed the border to rearm, refit, and rest from pursuers in Columbia. The team developed an institutional building program in support of Peruvian Navy Amazonas Command. The MIST also developed a program that spearheaded the launching of the DEAs Rewards for Information Program, focused primarily in the Northwestern part of the country. Since 1999, U.S. military personnel have trained 140 Peruvian Army personnel in basic demining techniques. Tim recalled the real world psychological operations he participated in while assigned to the 1st PSYOP Battalion (Airborne) at Ft. Bragg and during numerous deployments in Latin America. His recollections sparked some of my own. Our shared experiences while with the 1st PSYOP Battalion were focused on US Army missions of support to counter-drug operations in the region. It was also a time of Cold War competition world-wide. In the US the civil war in El Salvador and the conflict between the Sandinistas and Contras in Nicaragua were seen through the Cold War prism. 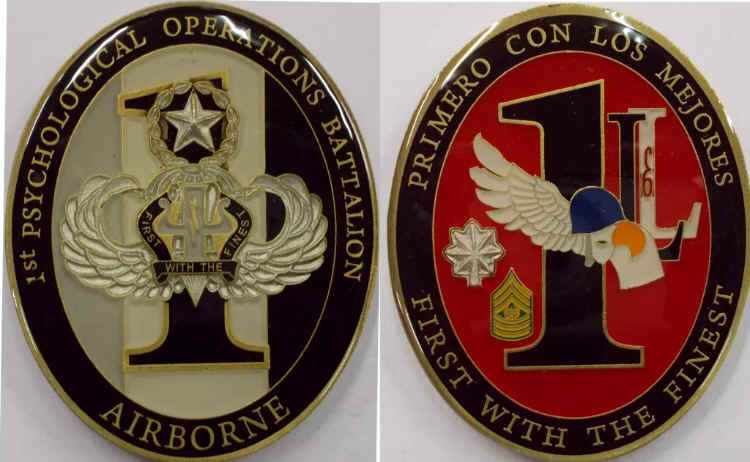 The 1st PSYOP Battalion was engaged in public and classified operations in support of both missions throughout Latin America. It was a heady time for young soldiers and young officers who dealt on a daily basis with government agencies in Washington and US embassies overseas. As a young soldier engaged in these operations Tim Wallace had a large audience that was unaware of the youthful artist behind the posters and leaflets that they saw. As commander of the 1st PSYOP Battalion, I must admit that I took Tim and his talent for granted. I thought he was the typical graphic artist that the Army turned out and assigned to psychological operations units like mine. From left: U.S. Army Sergeant Russell Robson and U.S. Army Captain Jake Bruder, students in the Basic Psychological Operations Course, sit with Colombian Army Colonel C�sar Alberto Kar�n Ben�tez, commandant of ESMAI. U.S. Army Sergeant Russell (Rusty) Robson told me about his 2018 graduation from the Colombian Armys School of International Missions and Comprehensive Action (ESMAI). Rusty is a 37F, PSYOP sergeant. He deployed with Company B, of the 1st PSYOP Battalion, Detachment 1B30 to Bogota, Colombia, in early 2018. He worked in the U.S. embassy for 2 months working as part of the Military Information Support Team. 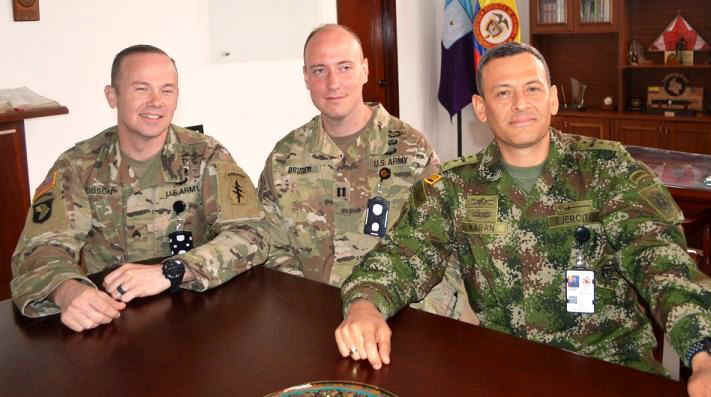 He was then tasked, together with Captain Jake Bruder, to attend the Colombian PSYOP course as a student, to better understand the Colombian psychological Operations doctrine so that the Americans could support it better and more efficiently. For more than 11 weeks, Colombian and U.S. service members strengthened their knowledge on techniques and resources to transmit messages to hostile, neutral, or friendly audiences to support the Colombian Army's institutional objectives. 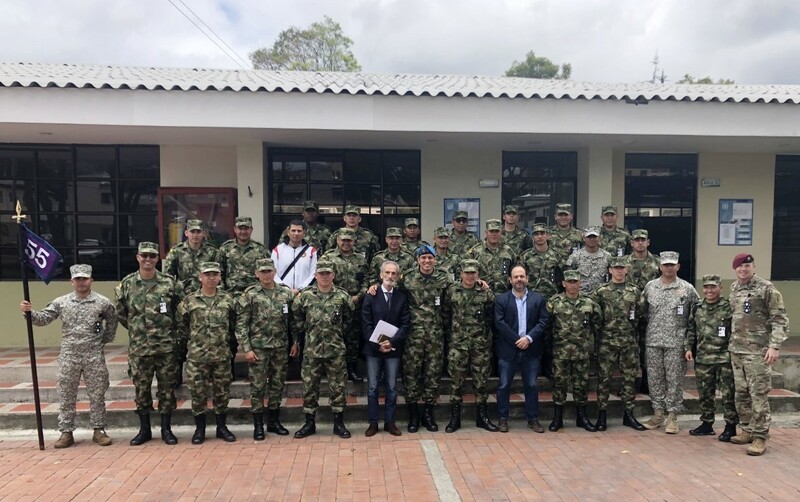 The course covered the Colombian Armed Forces lessons learned on comprehensive action tasks that strengthen the Colombian government while providing humanitarian assistance to communities in need. ESMAI has become a pioneering school for regional training, evidenced by the high number of international students. In recent years, more than 300 foreign officers and noncommissioned officers trained in different disciplines. In June, two U.S. officers finished the Basic PSYOP Course, while one Ecuadorean and two Mexican students took part in the next edition of the course, in July. Other ESMAI courses attract international participation as well, such as the Combat Camera Course that ended in August with 14 foreign students enrolled. 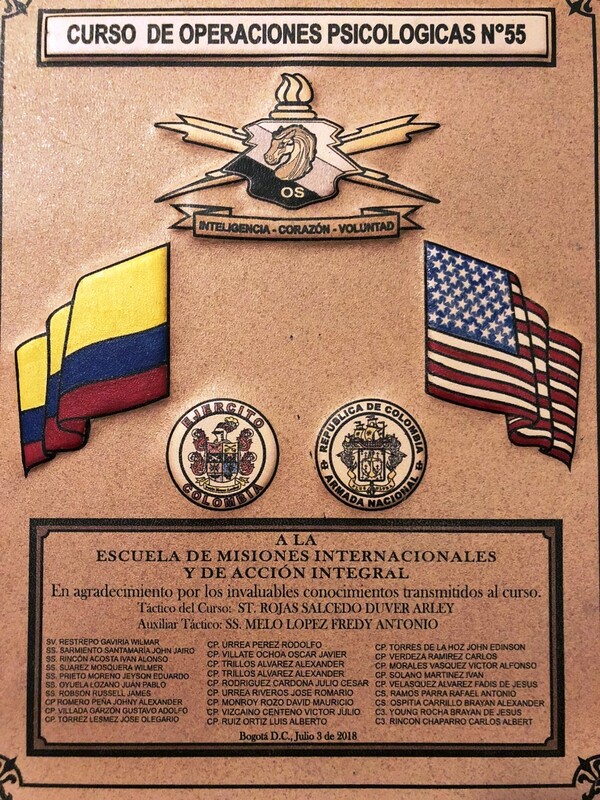 The U.S. Armys 1st Psychological Operations Battalion can claim success through the establishment of a dedicated Psychological Operations course at Colombias Escuela de Misiones Internacionales y Acci�n Integral or ESMAI; translated as The School of International Missions and Integrated Action. Acci�n Integral serves as the Colombian equivalent of U.S. Civil Affairs and PSYOP, but they are integrated within a single command structure from the Ministry of Defense down to battalion and company levels. 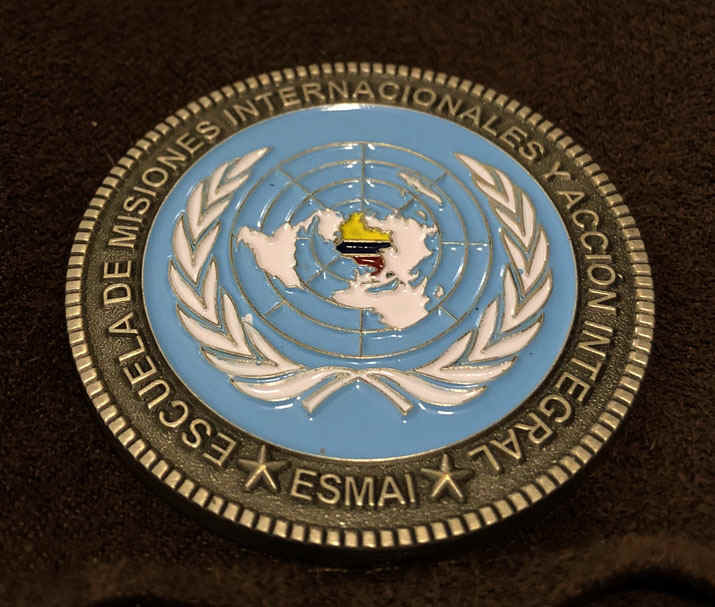 Prior to the establishment of ESMAI, the training of Colombian PSYOP personnel fell under the direction of Escuela de Relaciones Civiles y Militares (ERCM), the School of Civil and Military Relations. The school's training was derived from the original mobile training teams sent from 1st Psychological Operations Battalion (Airborne), and with the assistance of ERCM instructors, trained Colombia Military forces in the art and science of PSYOP. The members of 1st PSYOP Battalion work in conjunction with the leadership of ESMAI to constantly improve the capability and the relationship that has developed over the past three decades. 1st POB Soldiers provide vast knowledge of PSYOP from operations around the world, in both combat and non-combat environments. 1st PSYOP Battalion Sergeant Russell Robson said about PSYOP: This tool can be very powerful, we use it to win wars without firing weapons; it helps induce behavior in our targets that favors our objectives. Its been very good for us; especially for me, because I made many friends here. I was able to see their situation in their unit, outside the school, such as what they have to do when they get here. That helps us have a vantage point on how to improve things. It also serves as an example to be better soldiers, better leaders. On 31 July 2014, Psychological Operations held an Open House at Ft. Bragg, North Carolina, to show what they do and exhibit some of their products. Sergeant Debra Vanham, a PSYOP Specialist assigned to B Company of the 1st PSYOP Battalion explains her job in the U.S. Southern Command area of responsibility. According to the Washington Office on Latin America's Defense Oversight Program database the Department of Defense Rewards Program for information leading to the arrest of terrorists, drug traffickers and other wanted persons in South America yielded successes and offers a model for a low-cost, small footprint approach to counterterrorism. In 2014, the Department of Defense Reward Program area enabled partner nation authorities to bring 33 members of terrorist organizations to justice. In 2015, the Department of Defense Rewards Program enabled partner nation authorities to bring 135 members of terrorist organizations to justice. In 2016, DoD Rewards Program enabled our Colombian, Peruvian, and Panamanian partners to bring 26 members of terrorist organizations to justice. 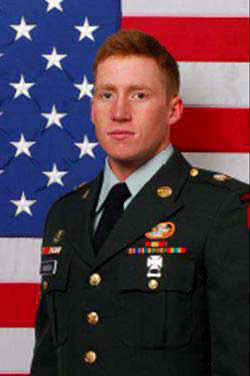 Corporal Nicholas Roush, of Middleville, Michigan, assigned to the 1st Psychological Operations Battalion (Airborne), died 16 August 2009 in Herat, Afghanistan, of wounds suffered when an improvised explosive device detonated near his vehicle. 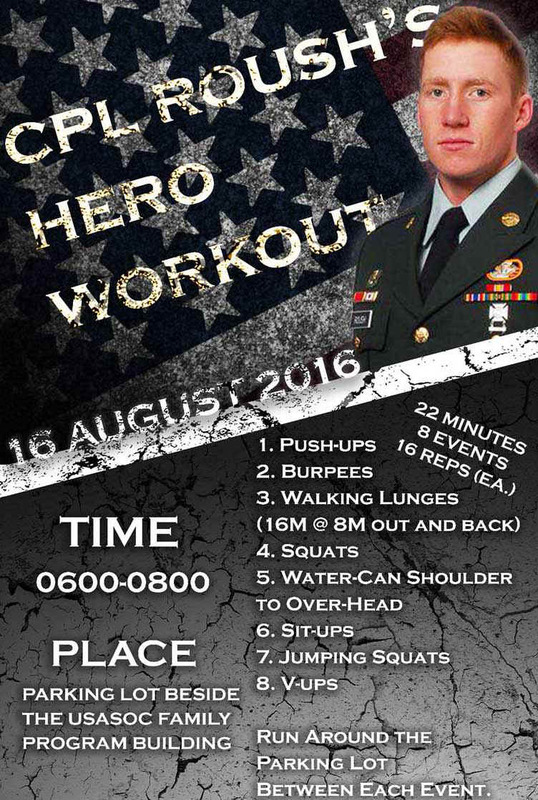 To commemorate the memory of Corporal Nicholas Roush, a Hero Workout was organized by the 1st PSYOP Battalion to commemorate his memory. This is the poster that the unit printed to advertise the event. Republic of Korea Presidential Unit Citation for KOREA 1951-1952. 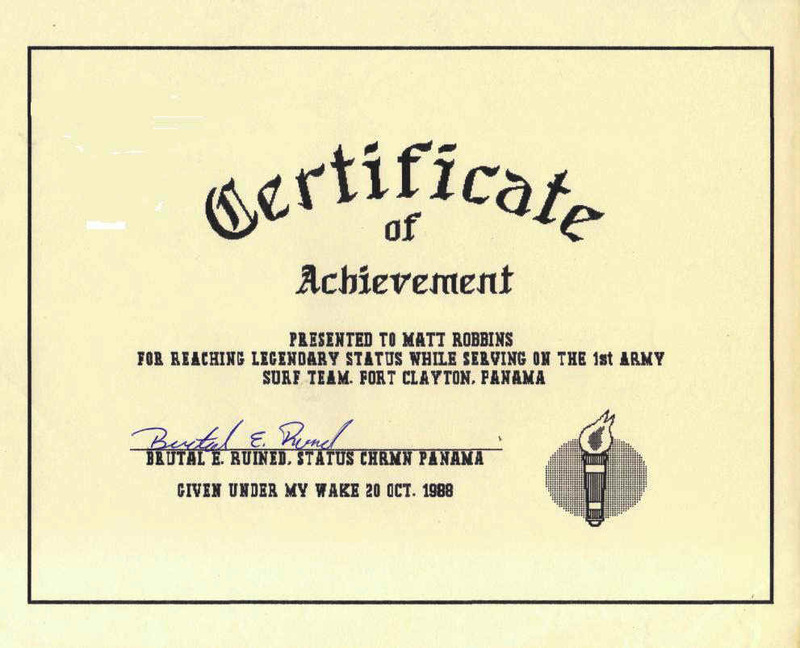 In addition the 1st PSYOP Bn received Campaign Participation Credit for Armed Forces Expeditions in Grenada and Panama.